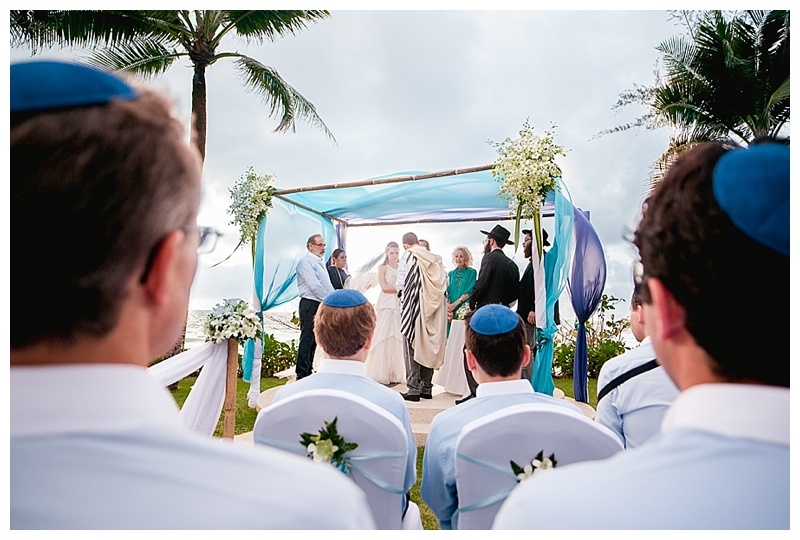 The chuppah in its simplest form is a canopy attached to four poles but there are literally endless variations. 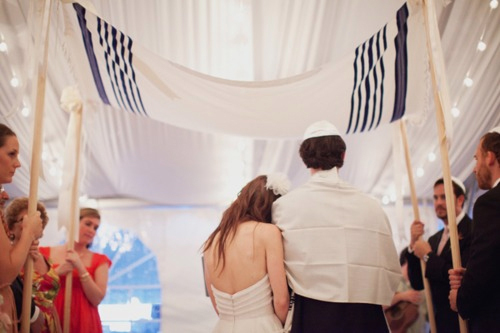 Try and incorporate ideas that reflect you as a couple into your chuppah, whether it’s having four close friends holding the poles (and these friends don’t have to be Jewish! 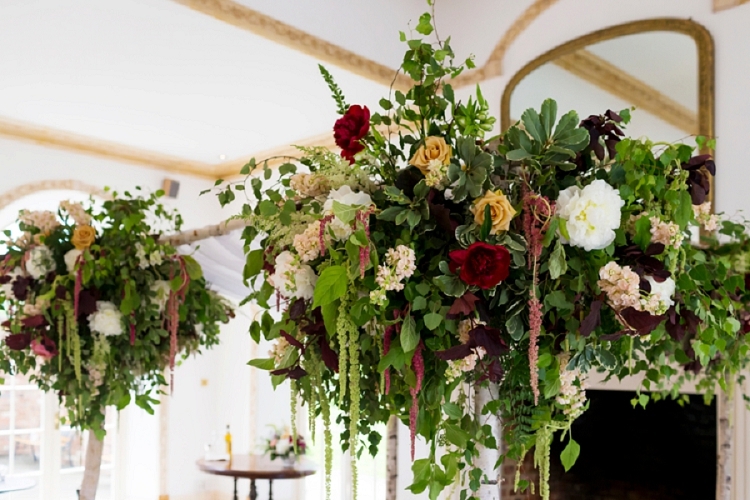 ), or using your favourite flowers, or colour combinations; or simply creating something extraordinary that you love the look of. 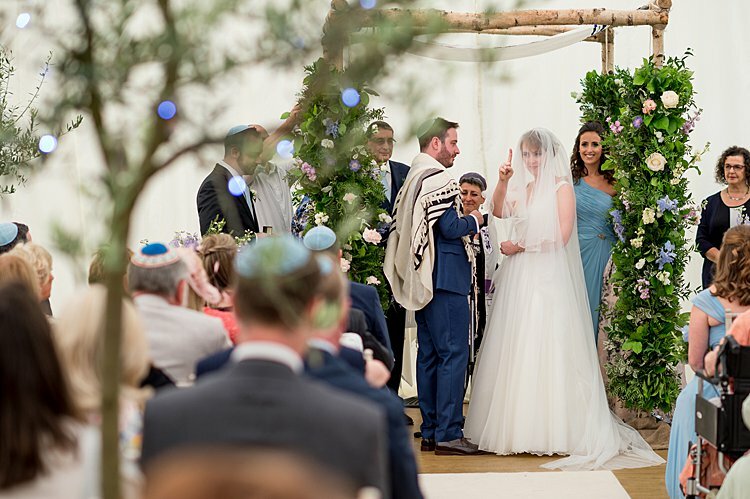 The chuppah symbolises the home you and your partner will build together during your marriage, but as well as using the chuppah to celebrate your spirituality, let your personality shine through too! 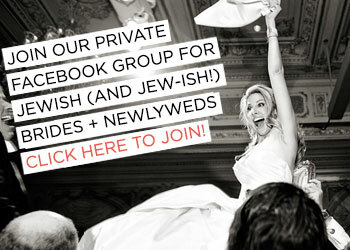 Oh… and for the perfect accessory under the chuppah you’ll want one of our own-brand smash glass pouches (below!). 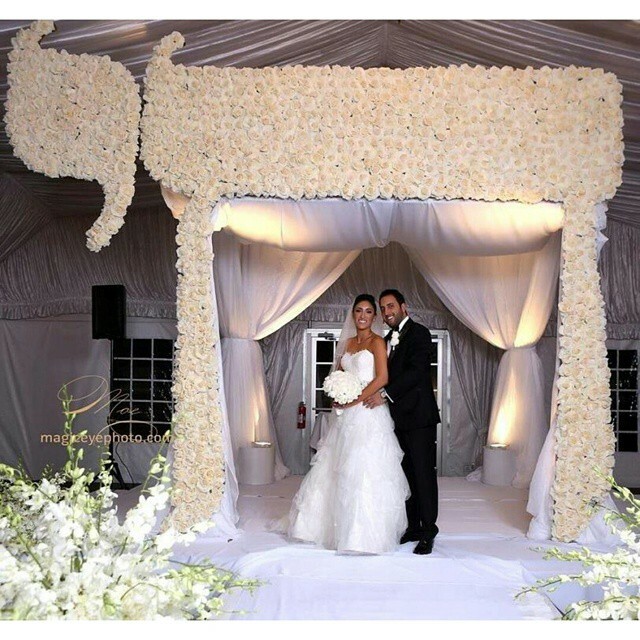 Enjoy the chuppah inspo and comment below and tell us which one’s your favorite! 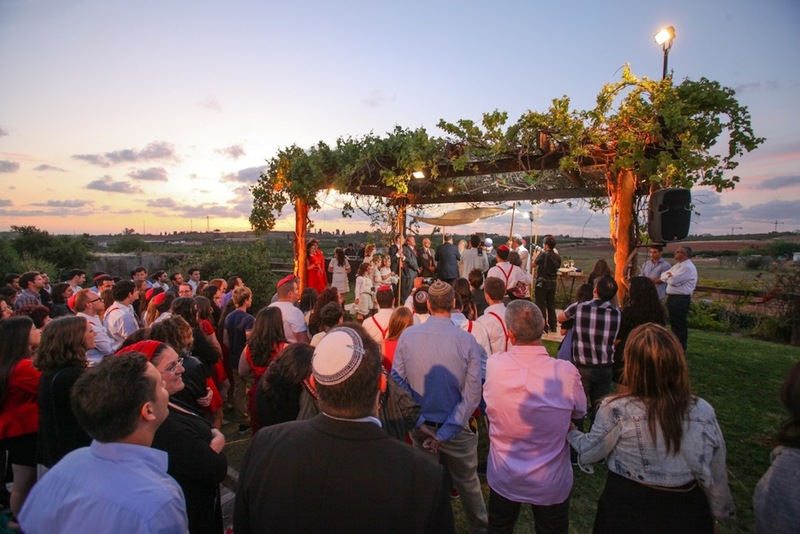 Buy a Smash Glass Pouch for under the chuppah! 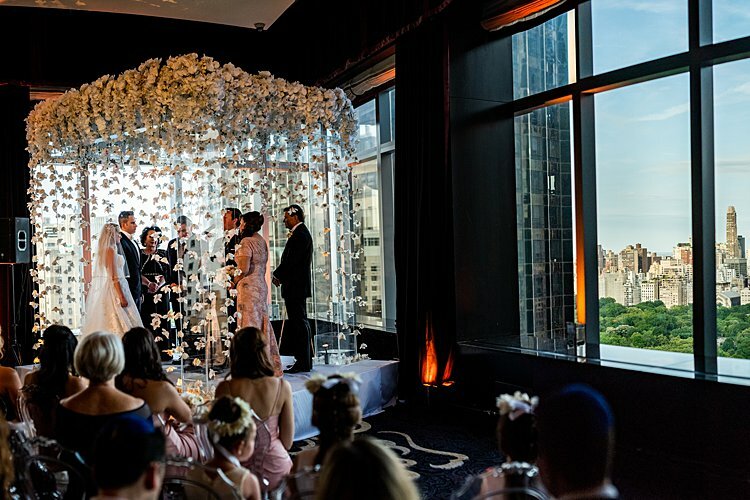 Just when we think we’ve seen every amazing chuppah idea out there, a new Jewish wedding comes along and knocks us off our feet. 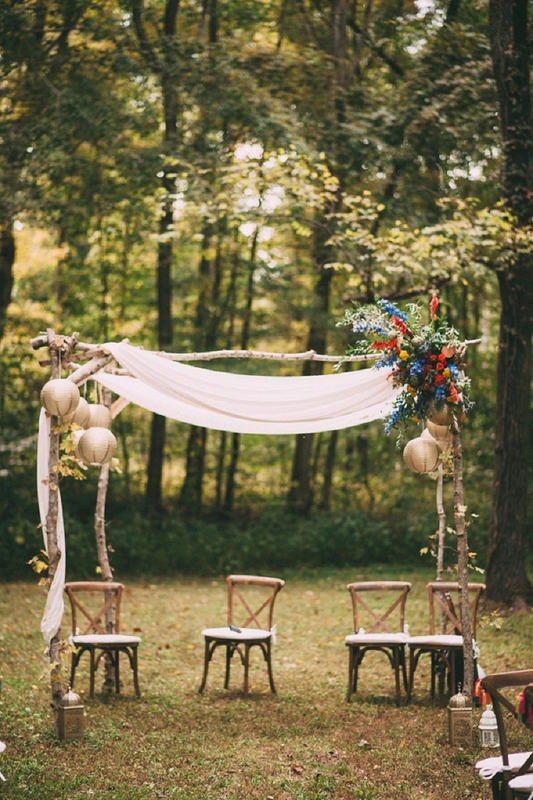 A DRIFTWOOD CHUPPAH! Thank you, Elsa and Stephane! Um, WOW. Excuse us as we pick our jaws up off the floor. We are just floored by the magnificent mirrored (!) peony. 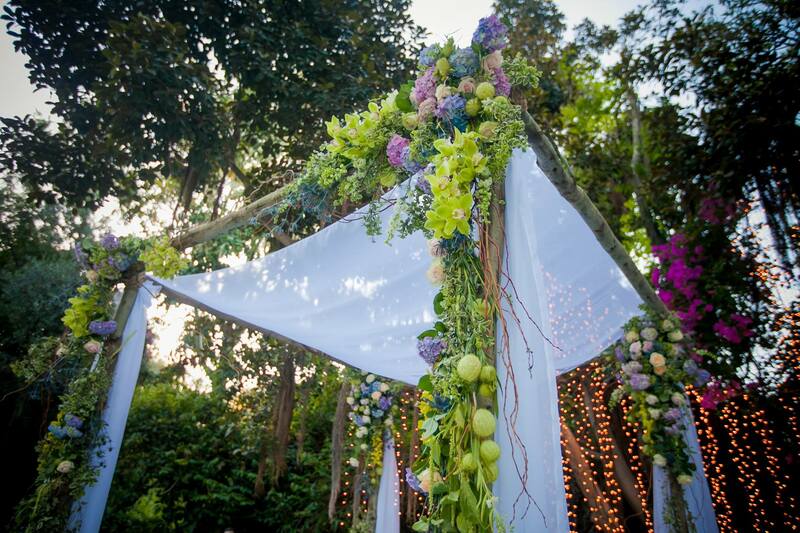 It is just BEYOND, and those hanging peonies suspended from the canopy? 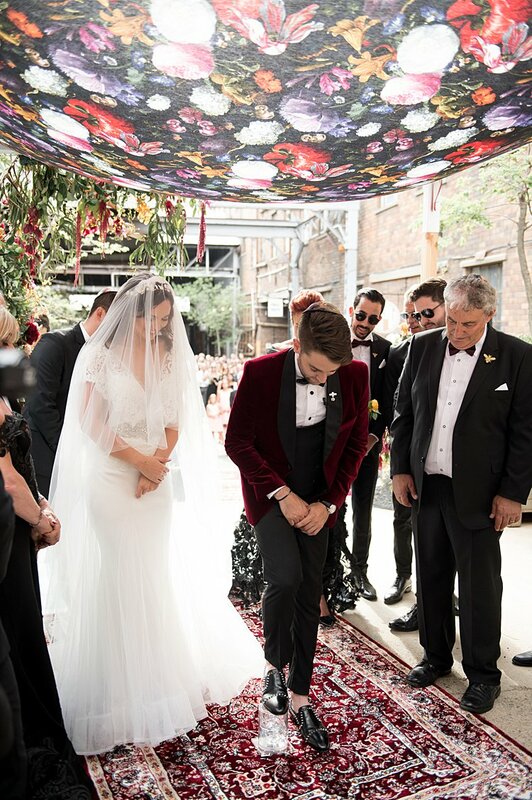 Serious, serious #chuppahgoals from Marina and Gary‘s wedding. 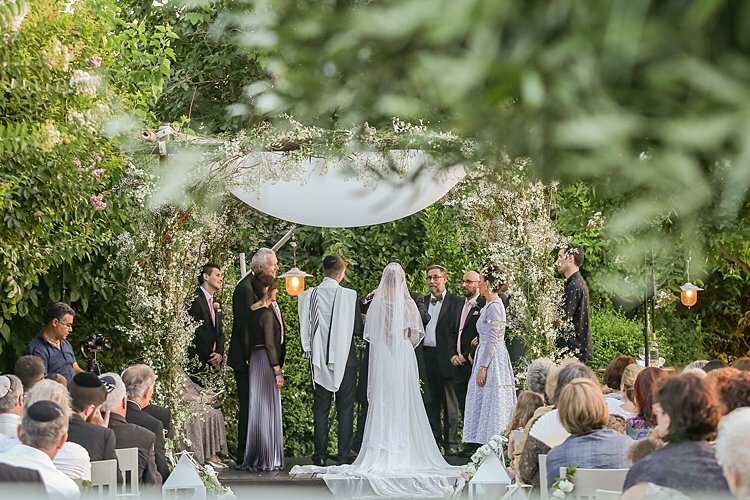 Lisa and Alexander‘s guests were escorted down an outdoor romantically lit pathway filled with large gorgeous trees, twinkle lights, and waterfalls until they came to the magically adorned garden where our chuppah took place. We’re a living THE dream! 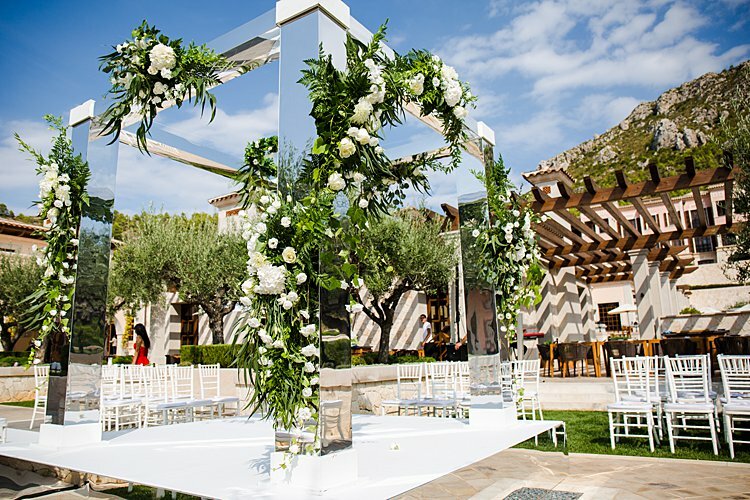 A super cool mirrored silver chuppah for Jade and Andy — cleverly set up to reflect the gorgeous grove of olive trees in the sunken garden surrounding the ceremony space! Who doesn’t love rose gold? 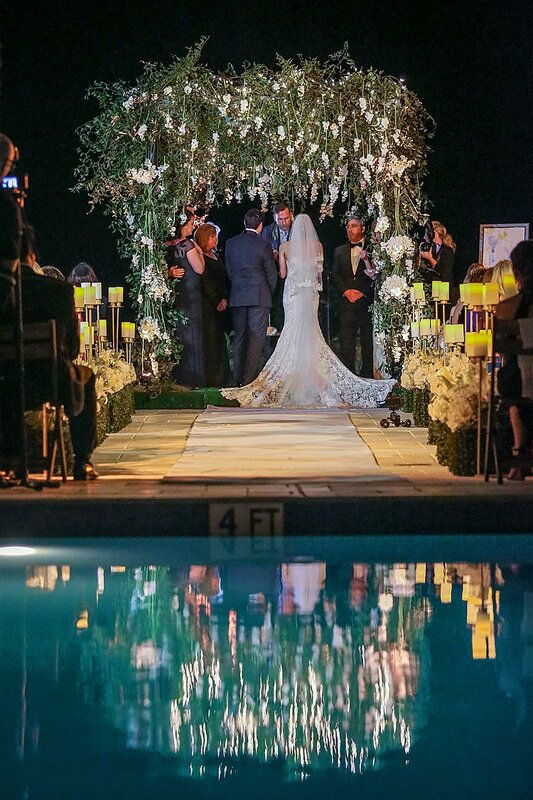 Now it’s everywhere, even in Jennifer and Charlie‘s simple and stylish chuppah. We can’t love it more! 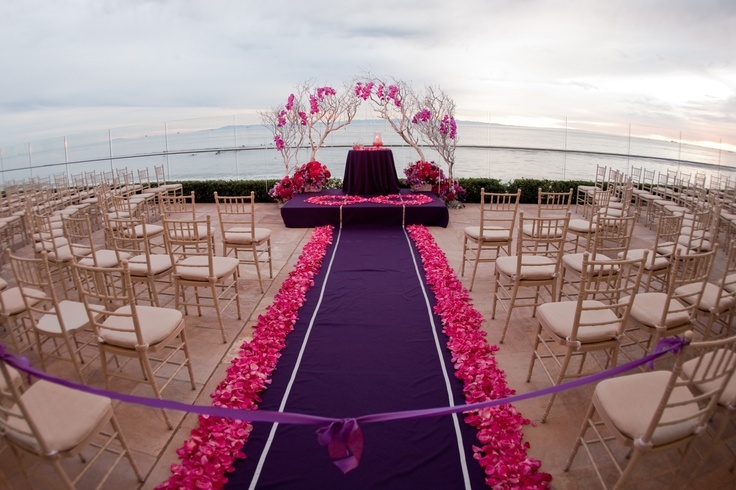 There are no words for how obsessed we are with epic orchid chuppah. 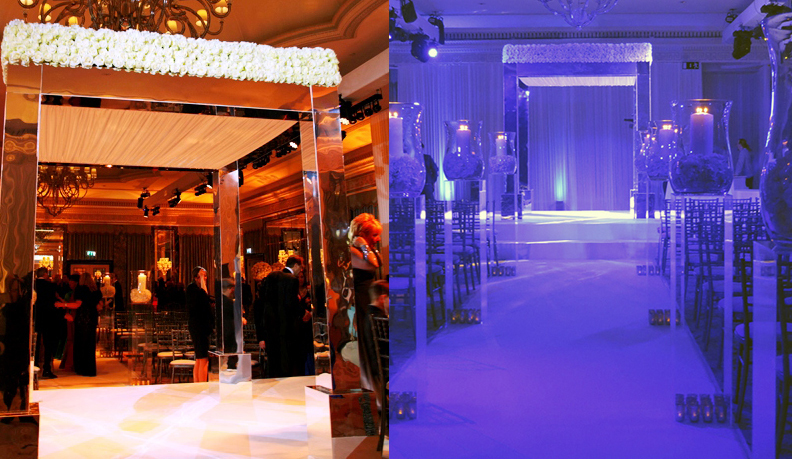 With lucite columns draped in strands of gorgeous flowers, it’s just SO dreamy! 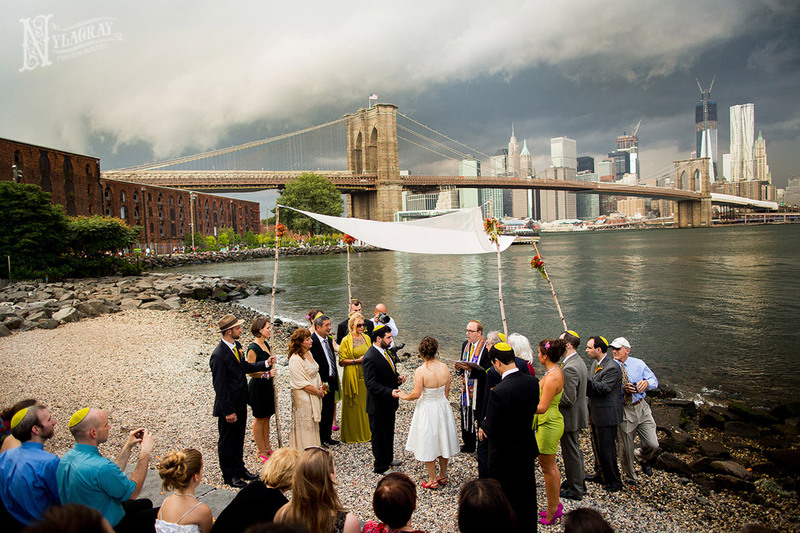 As seen in Vlada and Joshua‘s wedding. 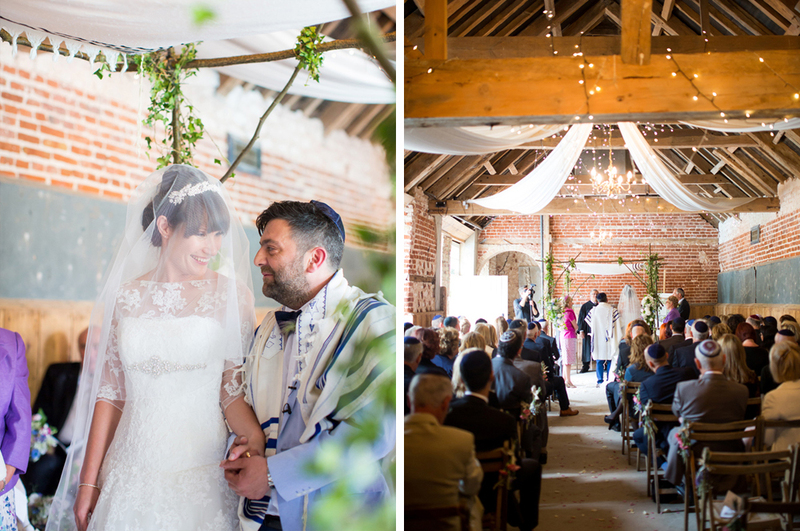 If you think that a wild natural design chuppah would look out of place in the uber-traditional synagogue setting… well, have a look at Chloe and Adam‘s chuppah! 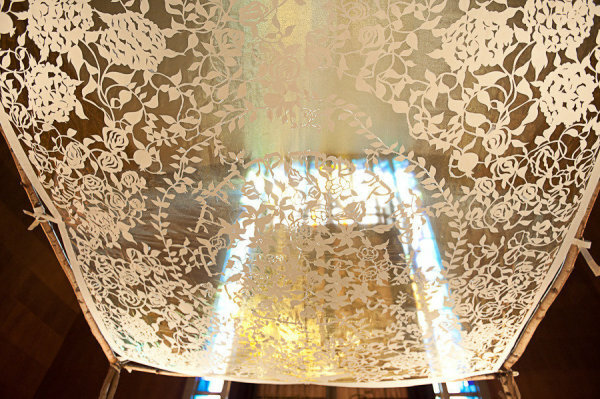 A little thicket of trees just happened to sprout up in the middle of the synagogue… and it’s a perfect fit! 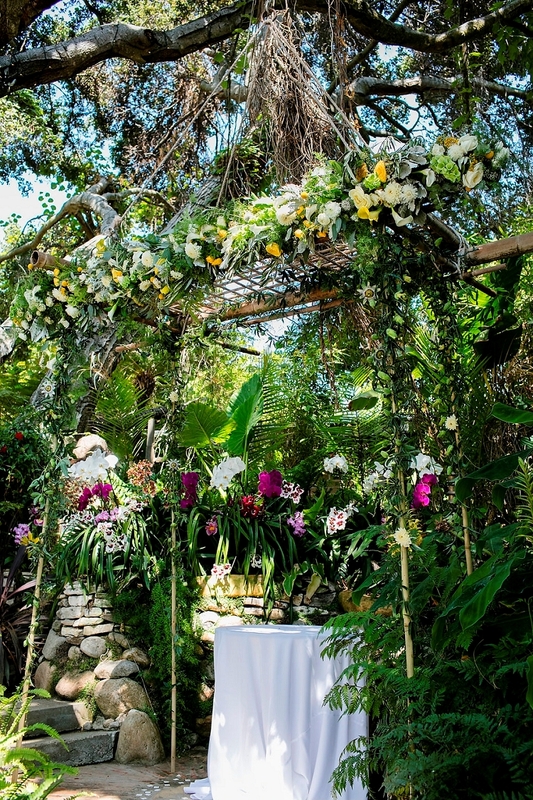 We love the botanical design of Kim and Jonathan‘s chuppah. So stylish, so cool! 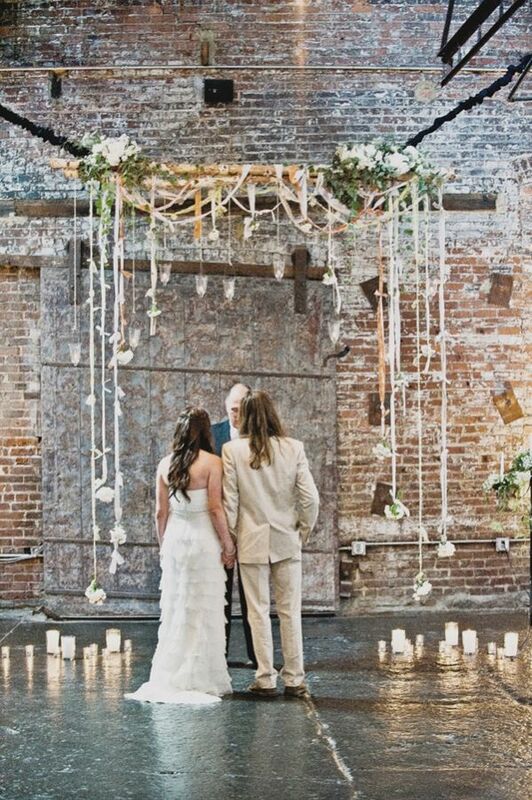 Just two words: Wisteria. 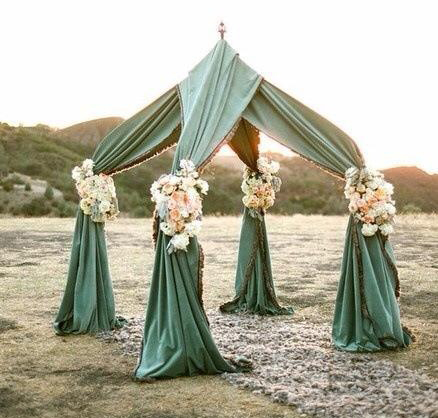 Chuppah. Just look at it! 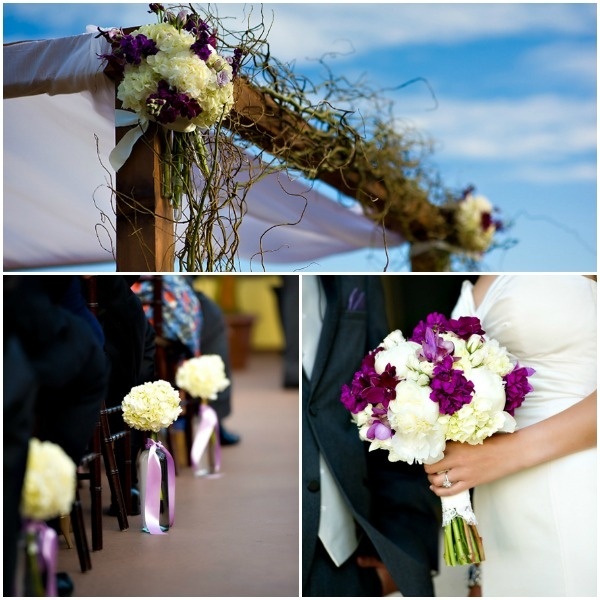 Have you ever seen anything more lovely than those simple strands of purple and white perfection swinging gently in the breeze? We’re pretty sure you haven’t. 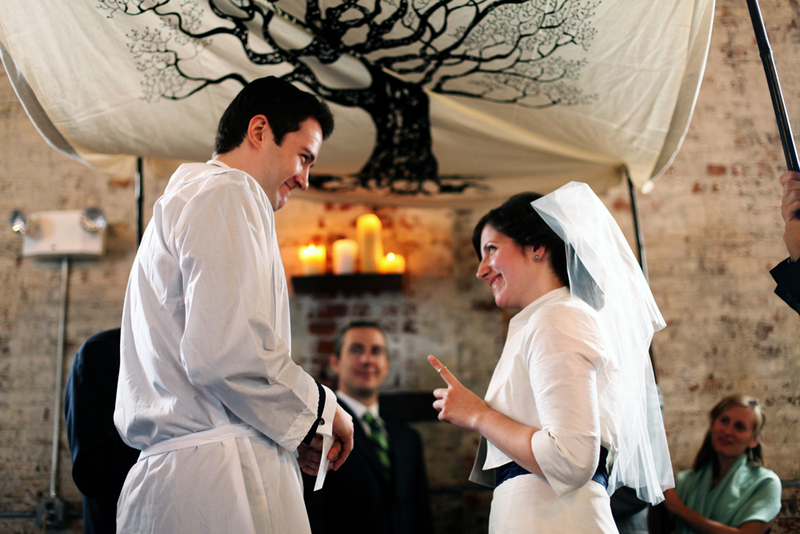 From Sophie and Andrew‘s wedding. 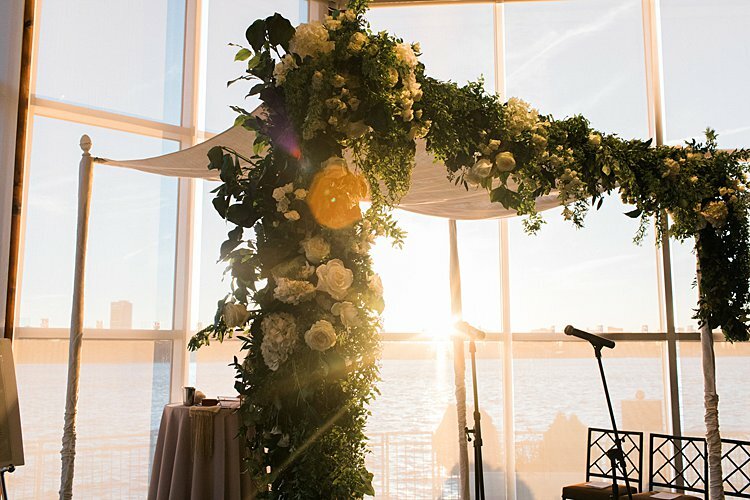 How cool does it look this suspended chuppah? 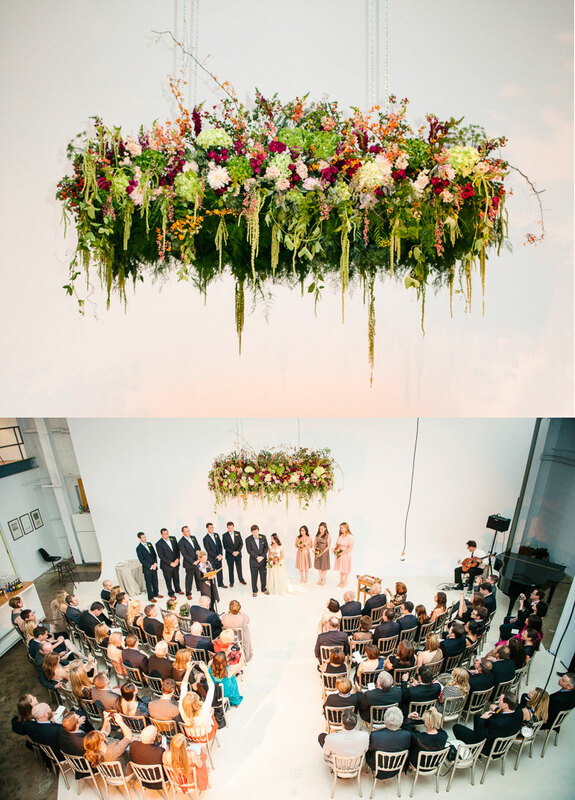 Assymmetrical greenery and white flowers descending from each of the four corners – an idea to steal from Jillian and Steven‘s wedding! Purple and orange can go together? Yes! 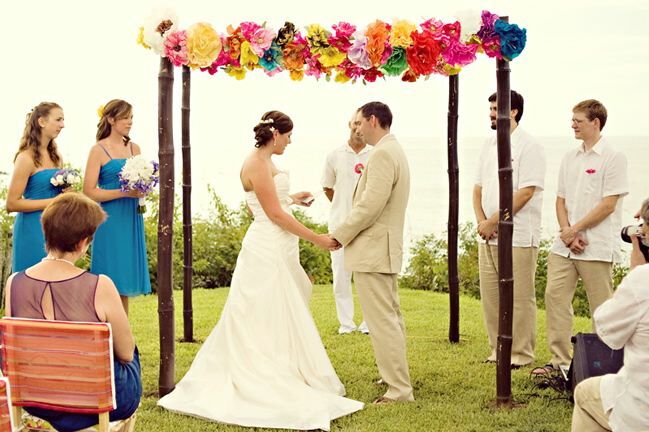 For all vibrant and bold colours lovers <3 , as seen in Julia and Brian‘s wedding. 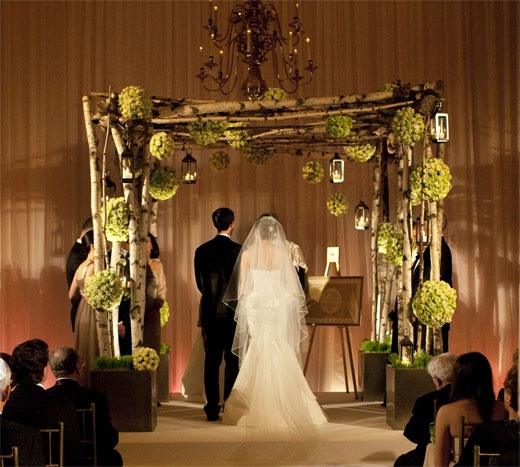 The sweetest birch chuppah ever! 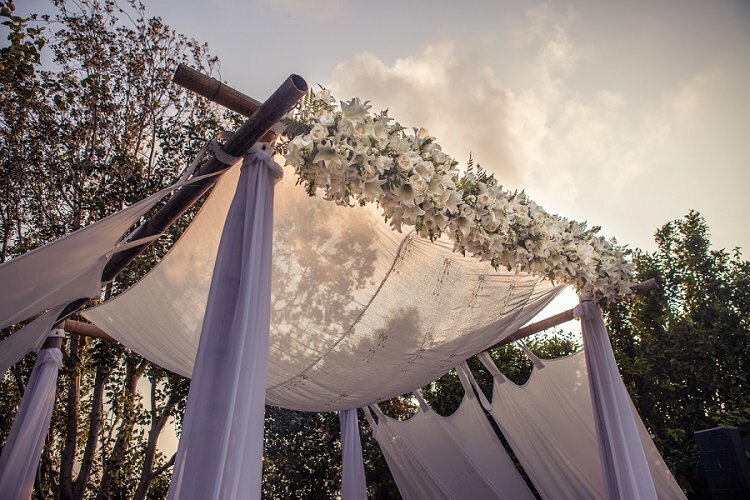 A touch of floral dà©cor draped over the top and the bride’s mother’s wedding veil as the canopy (aww!) 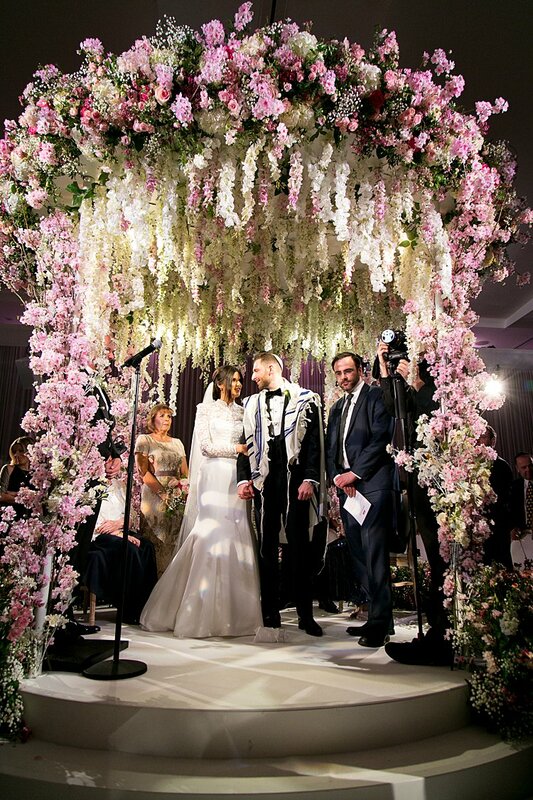 — this is a great example of how you can pull off a beautiful floral chuppah while keeping things subtle! Thank you, Tema and Brad! 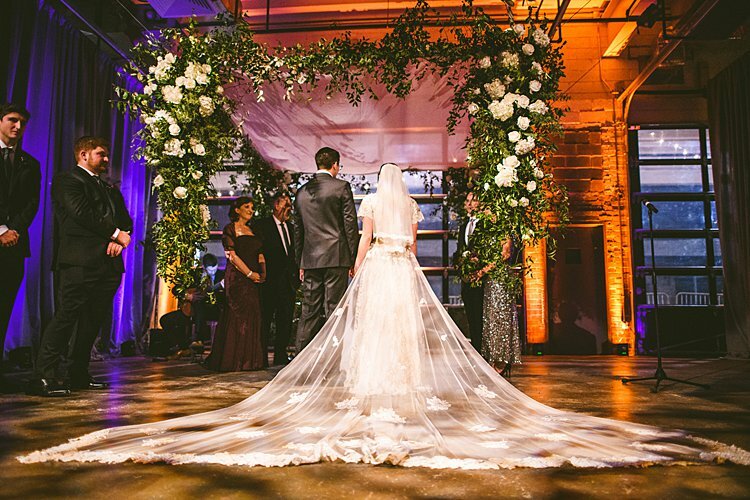 Brett and Dakota‘s jaw-dropping floral chuppah is just the dreamiest, lush and romantic as can be! 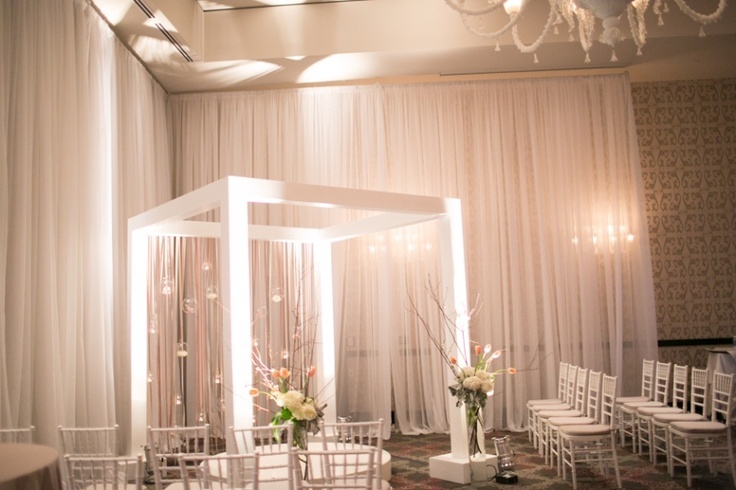 Look for a minimalistic, modern chuppah? 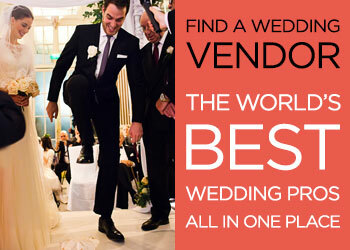 Don’t look any further! 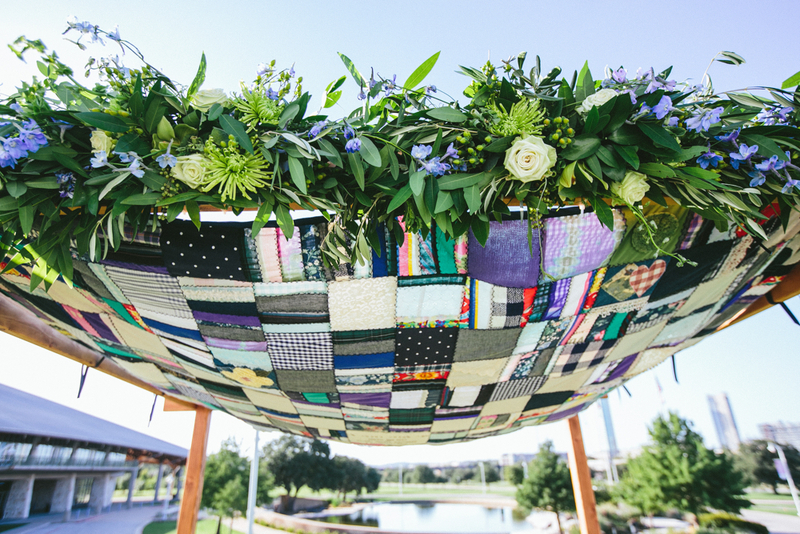 An idea to steal from Jeanette and Chris‘ super-stylish wedding. 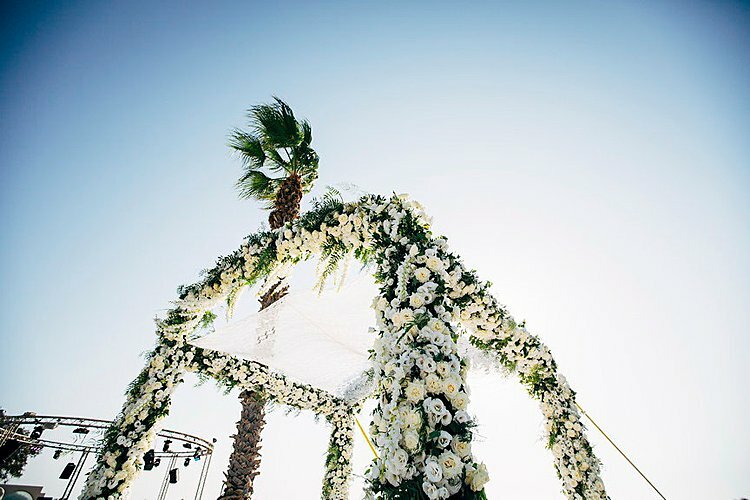 Just when we think we’ve seen it all when it comes to floral chuppah design, we’re proven wrong. 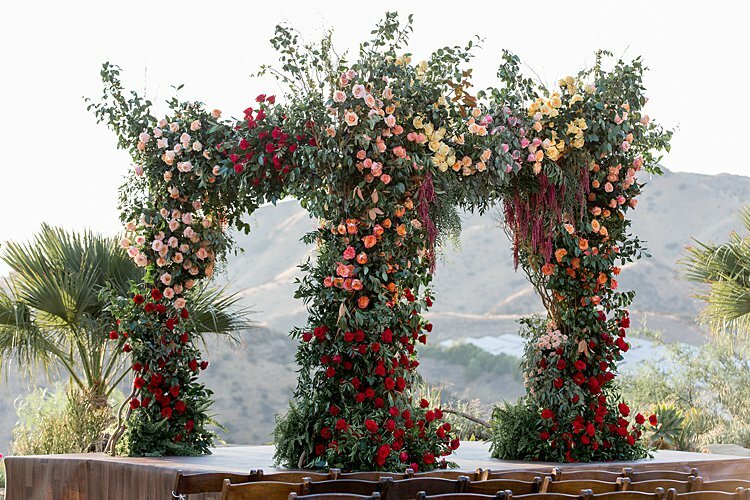 Just look at this floral chuppah of dreams. Jaw-on-the-floor WOW! 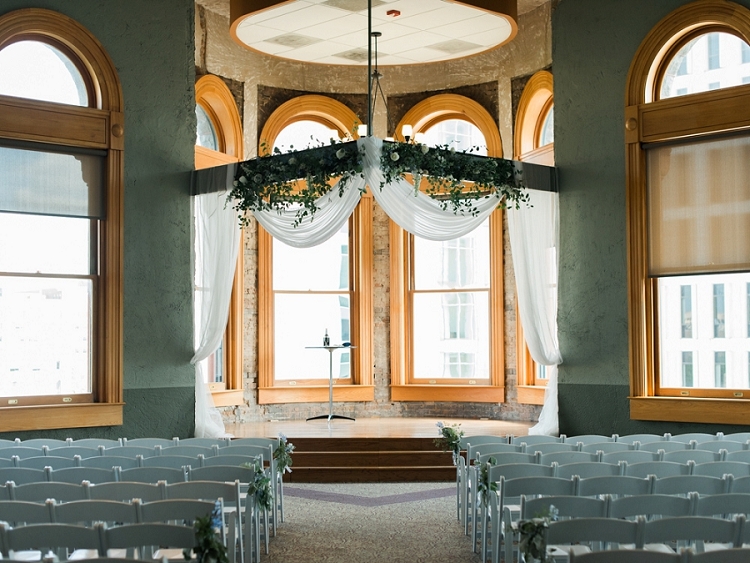 As seen in Natasha and Charles‘ wedding. 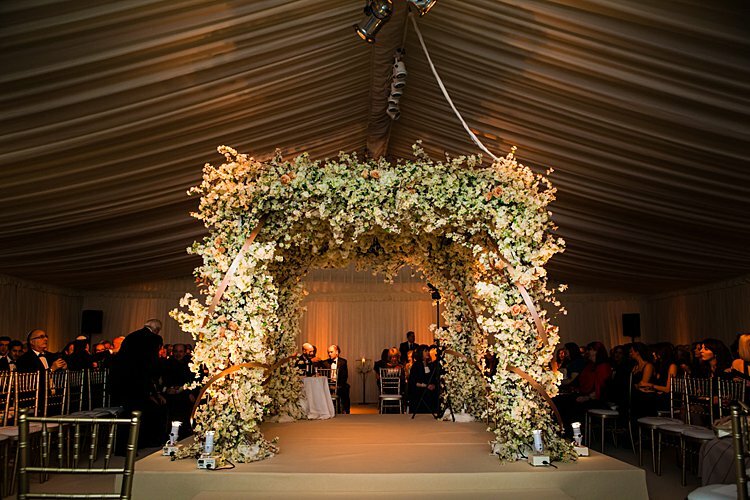 A timeless and elegant chuppah, with peach and ivory flowers and a hint of gold rose. Love how it stand out in the dark! 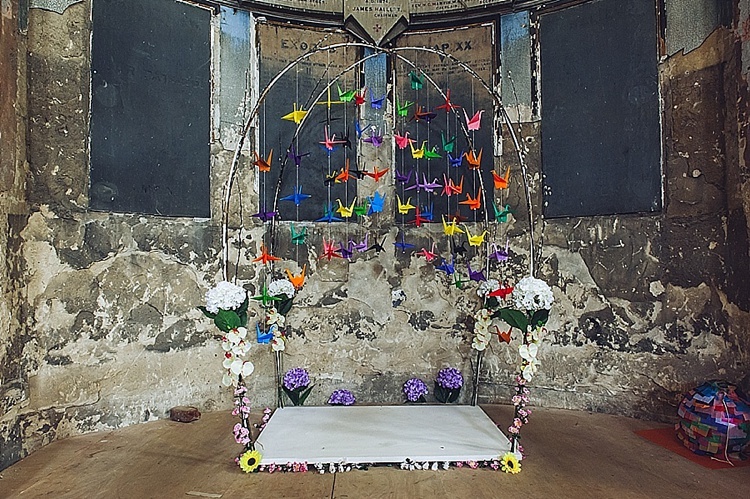 As seen in Claire and Mark‘s wedding. 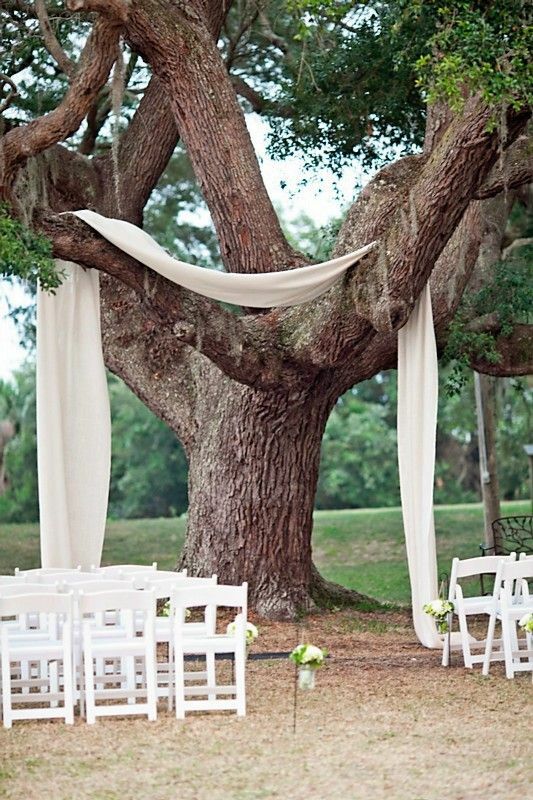 Do you see that canopy? 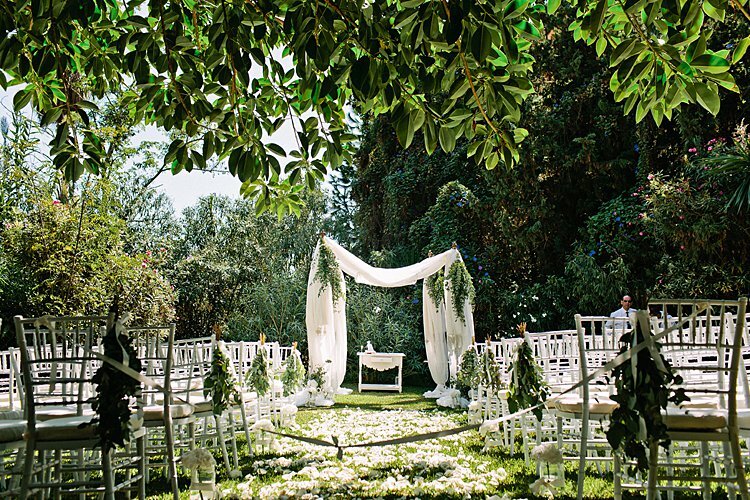 #chuppahgoals or what?! 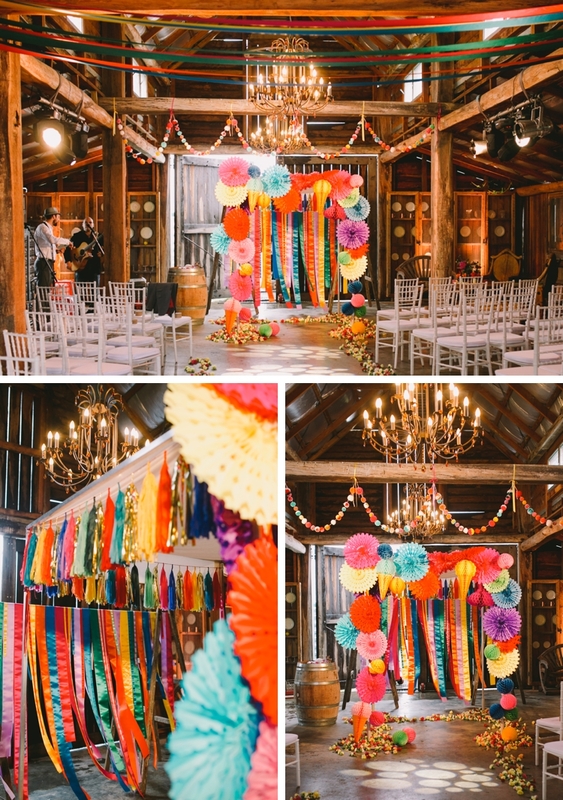 Idea to steal from Dani and Codey‘s colorful and edgy wedding. 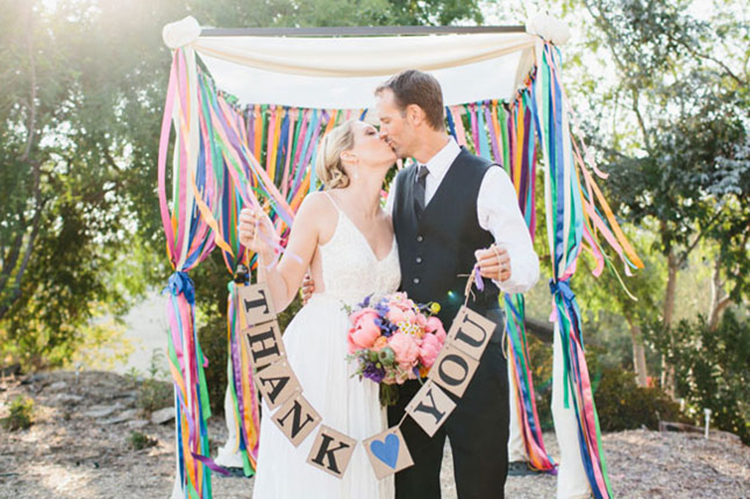 A lovely DIY chuppah, made with folded umbrellas to use as poles, draped in tulle and lace — including a square from the bride’s dress! Hayley and Ashley: you’re two genius! 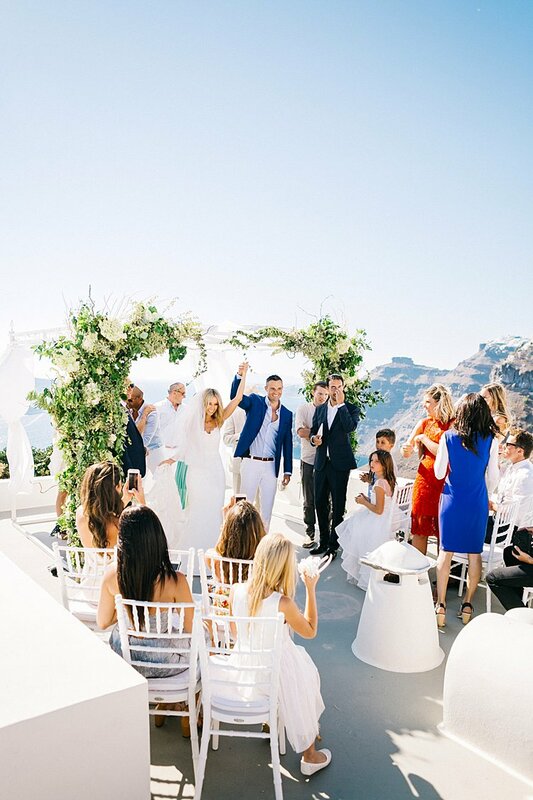 Lush greenery for a fresh and pretty (and not too formal) look, as Katie and Aaron went for at their amazing wedding in Santorini! Just WOW! 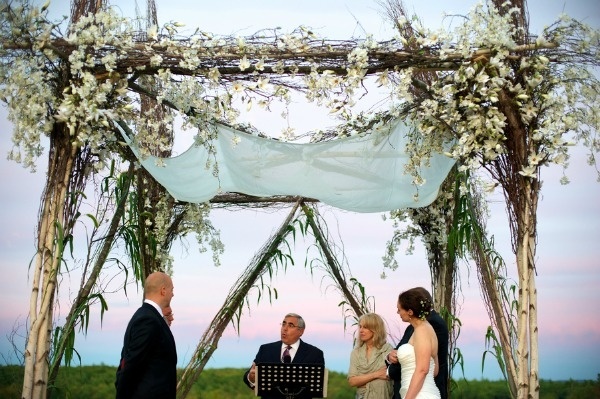 A grapevine chuppah? 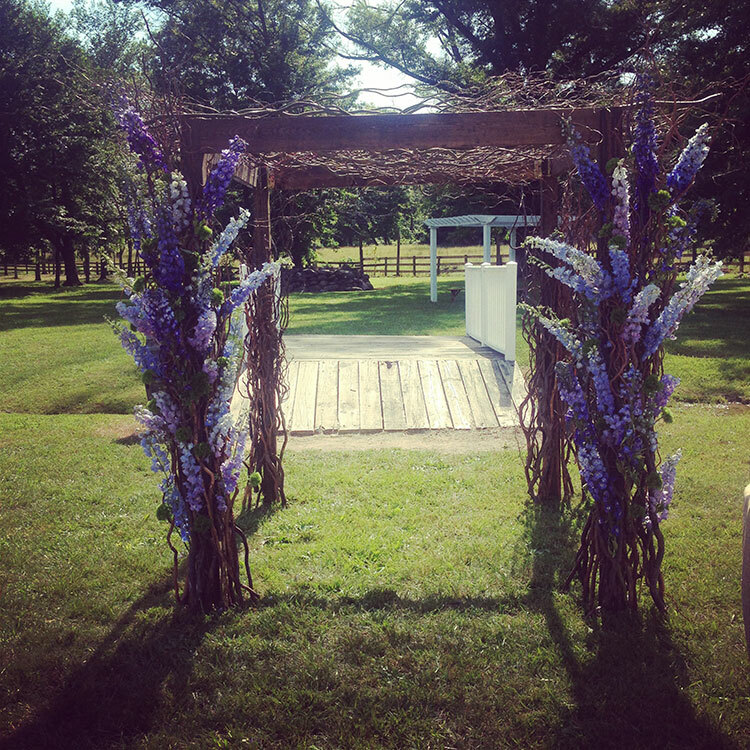 A grapevine chuppah?!! Yes, you read it right! 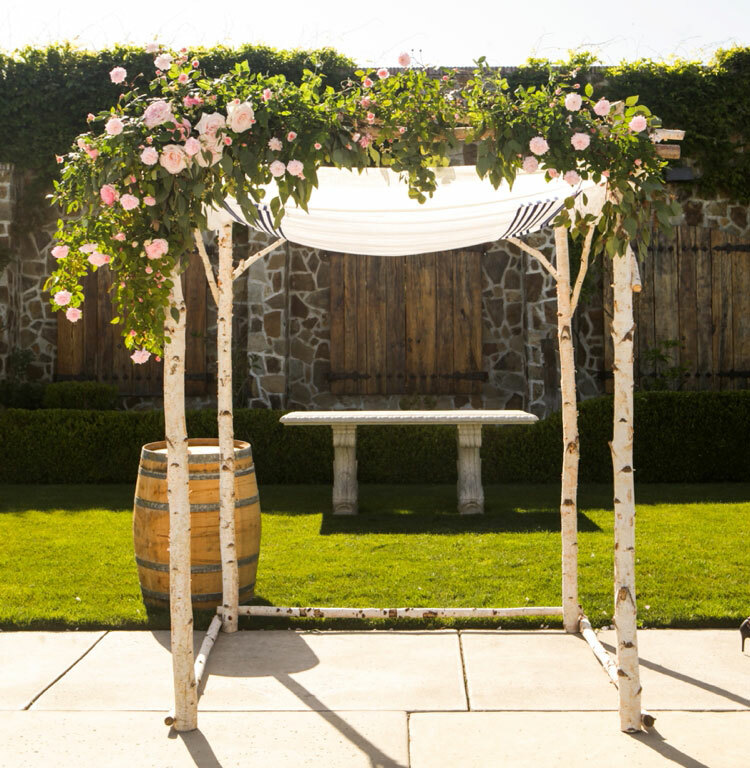 Adam and Lowell‘s got married in a winery, surrounded (of course) by rolling hills and vineyards. 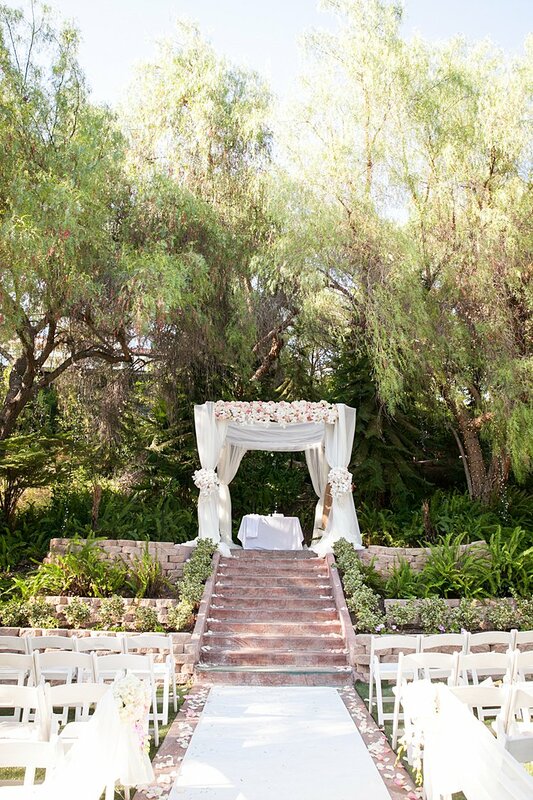 A one-way ticket to California, please! 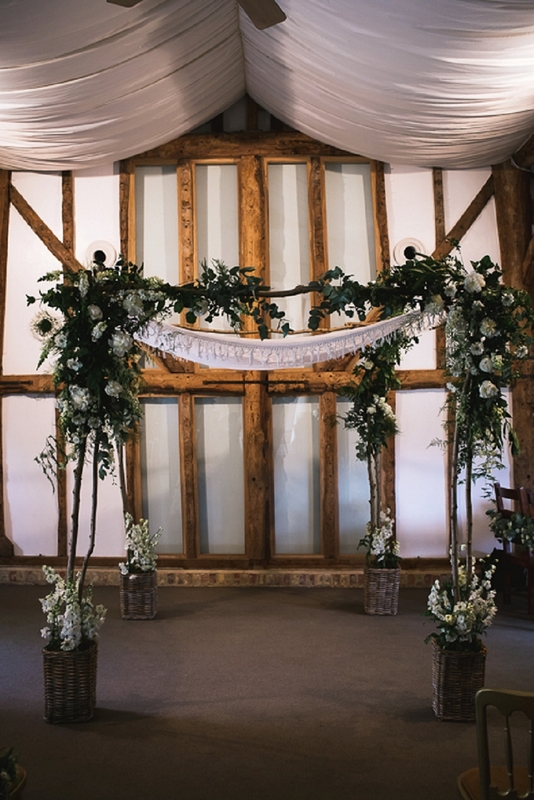 A white and green floral tones for an asymmetrical chuppah – we ADORE Hayley and Emmanuel‘s wedding because it’s full of creative idea! 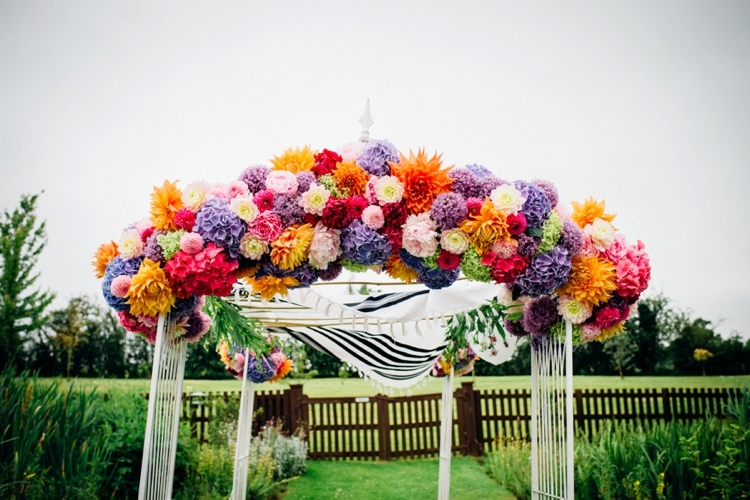 A DIY handheld chuppah full of colours (we looove that!) 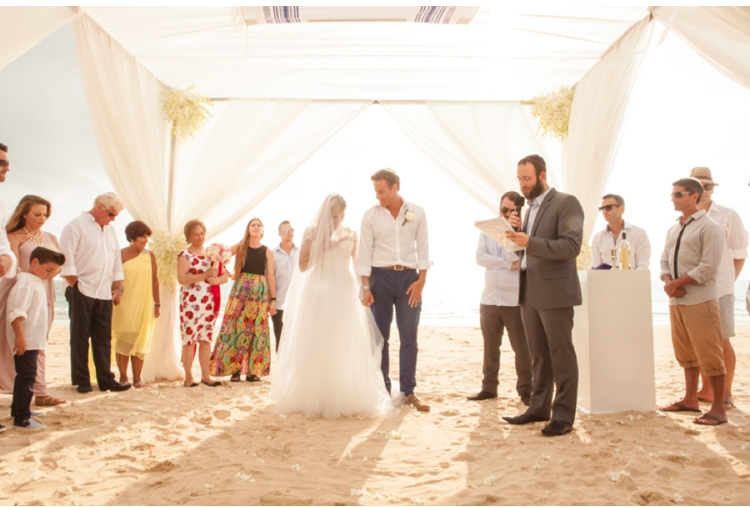 for Dana and Alex‘s laid-back wedding bruch wedding in Miami! 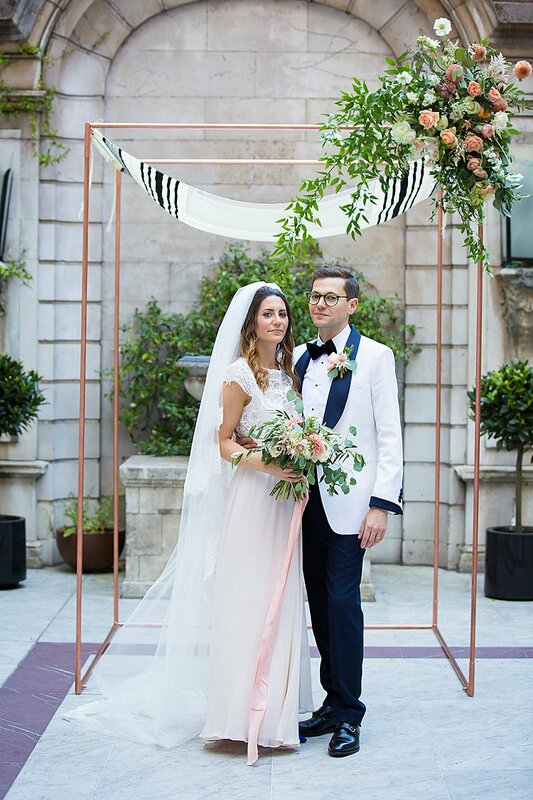 Pastel colour lovers, we have the right chuppah for you. 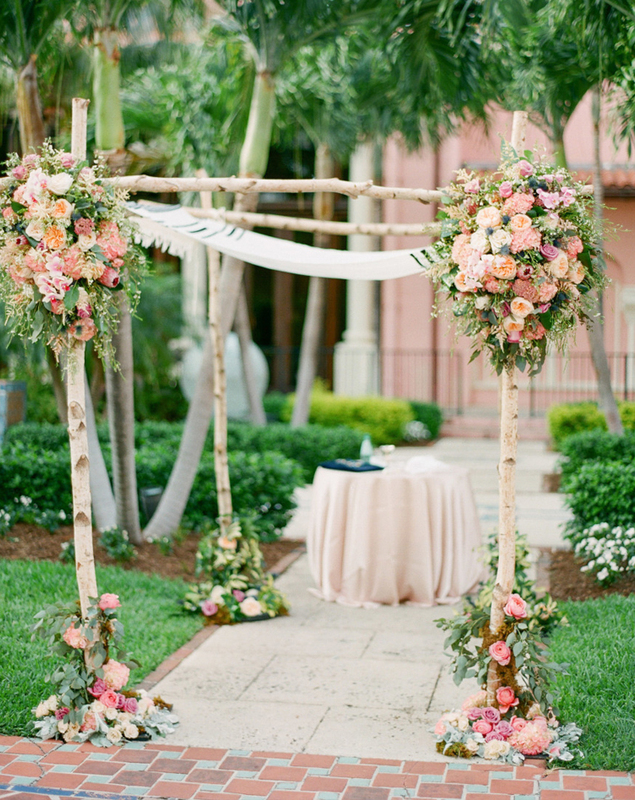 Blush and yellow pale flowers for a modern yet romantic chuppah, as seen in Katy and Max‘s wedding in Miami. 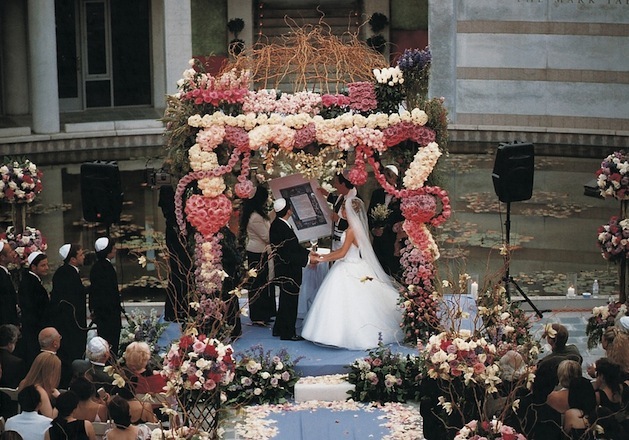 Getting all your guests to help decorate the chuppah with flowers? That’s what Tash and Ian‘s did. 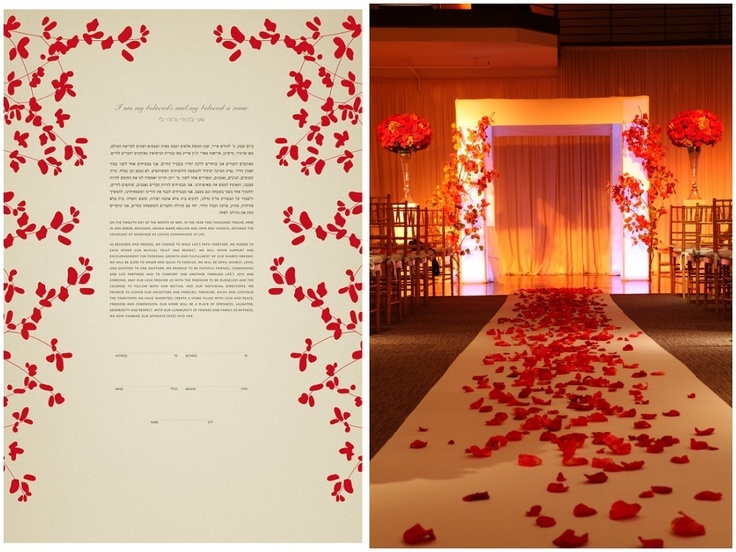 Clever idea and beautiful result! 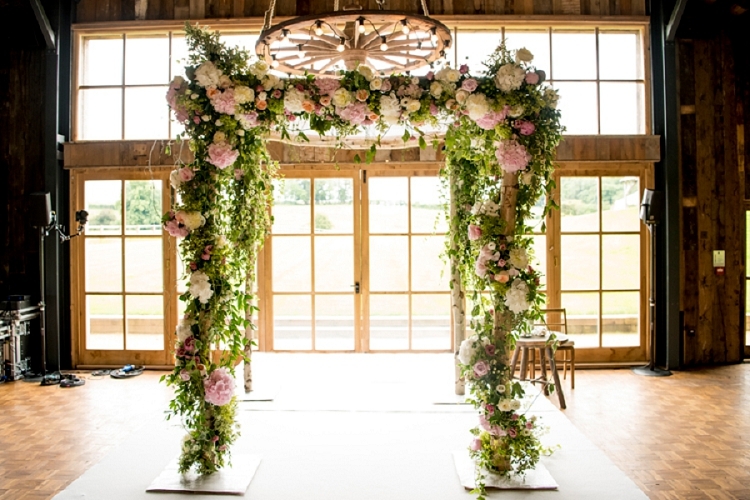 So in love with this white and green floral chuppah – like an open window to a beautiful landscape. 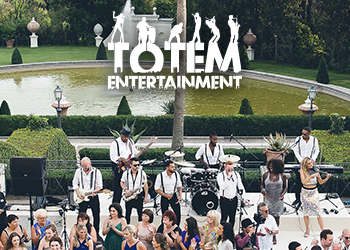 As seen in Danielle and Alex‘s super cool wedding. 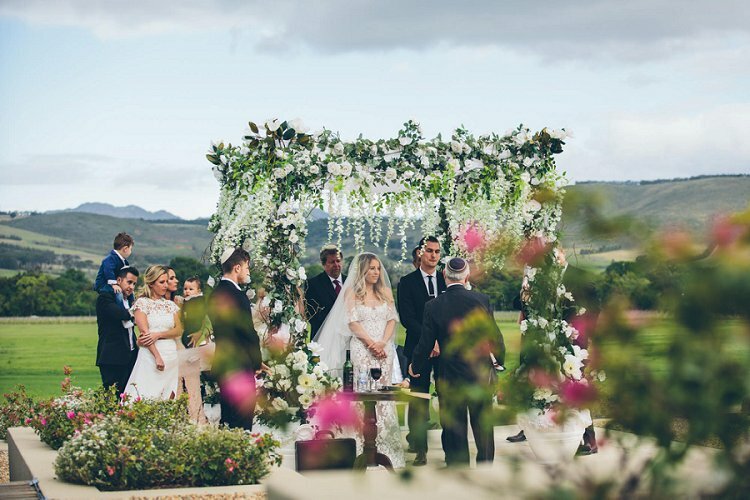 Natasha and Adam‘s chuppah is the right balance between luxe and simple: four narrow poles covered in greenery and white and cream flowers, all under a canopy of delicate lace. So elegant, yet exquisitely delicate at the same time. 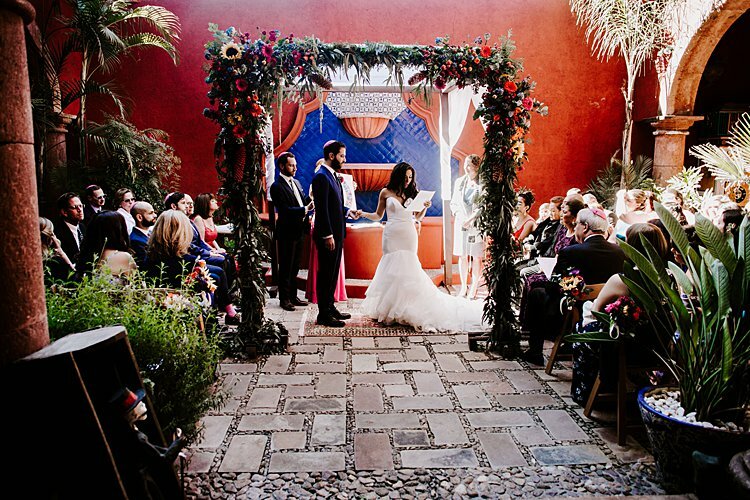 Karina and Garrett‘s chuppah was an homage to Oaxacan embroidery and Frida Kahlo paintings. 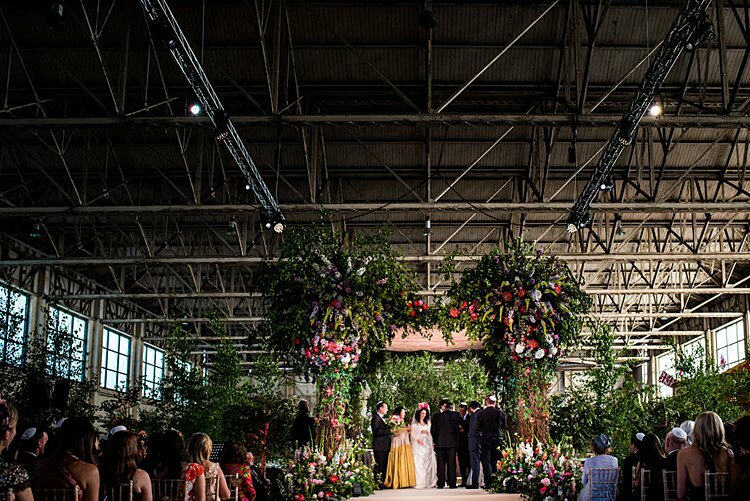 They wanted a lush, dark background with bright flowers to bring pops of color. For all Mexico lovers! 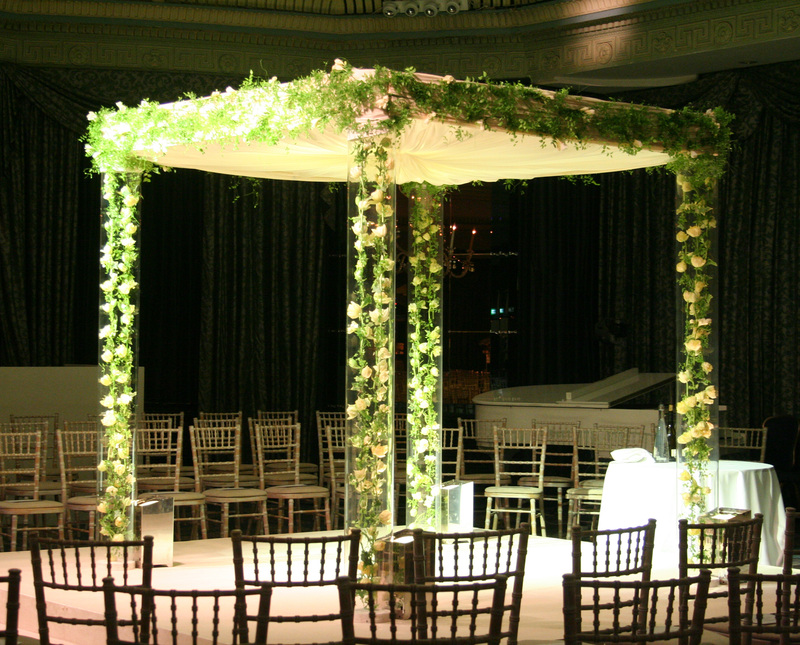 An orchid chuppah for a romantic and elegant look but simple and fresh at the same time. 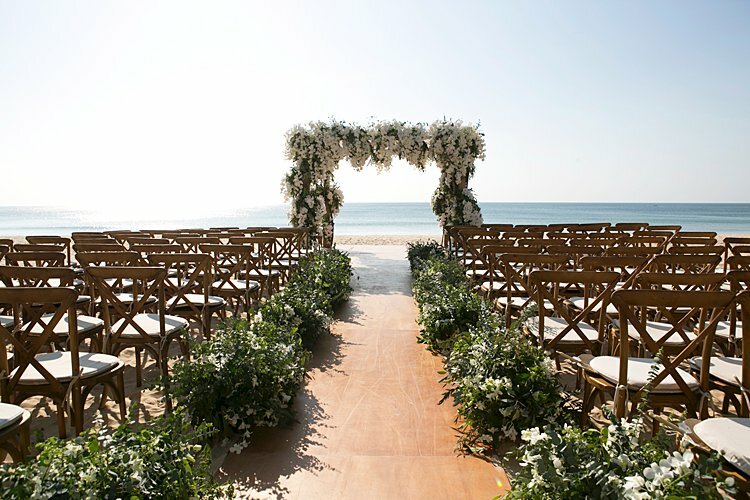 Truly a sight to behold and an idea to steal from Martine and Jarred‘s Destionation Wedding in Phuket, Thailand. 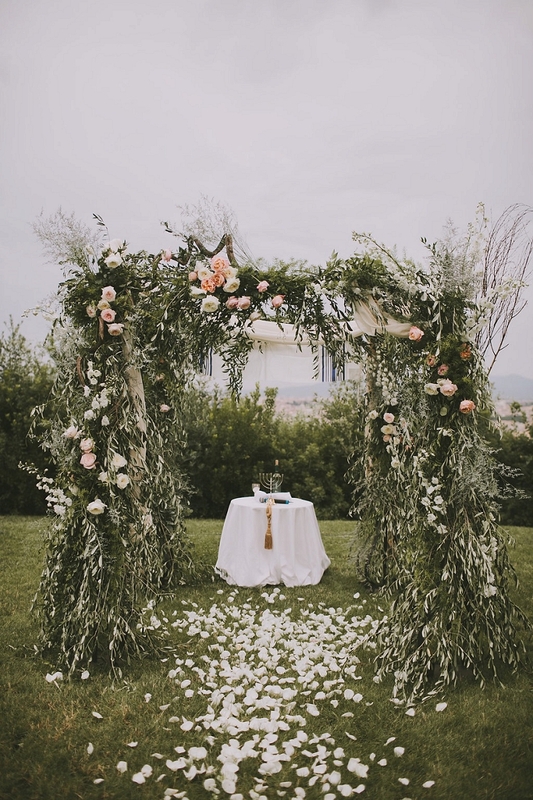 A white and green beautiful, classical but at the same time informal chuppah as seen in Tara and Ben’s Jewish wedding in Florence. 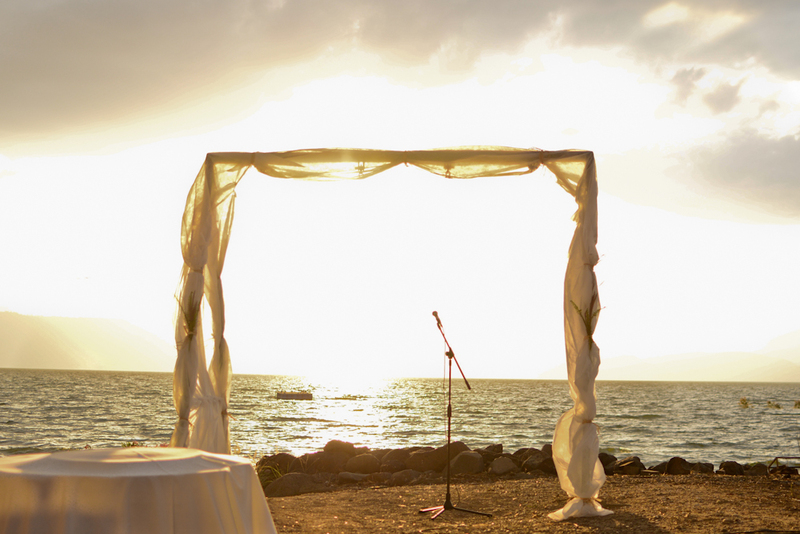 Want to make the most beautiful backdrop stand out? 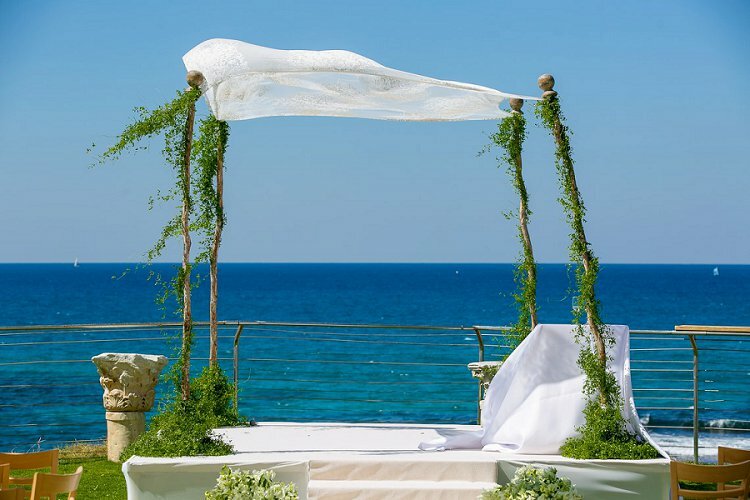 No matter if it’s sea or mountains, the simplicity of this chuppah design really keeps the focus on the powerful view behind it. 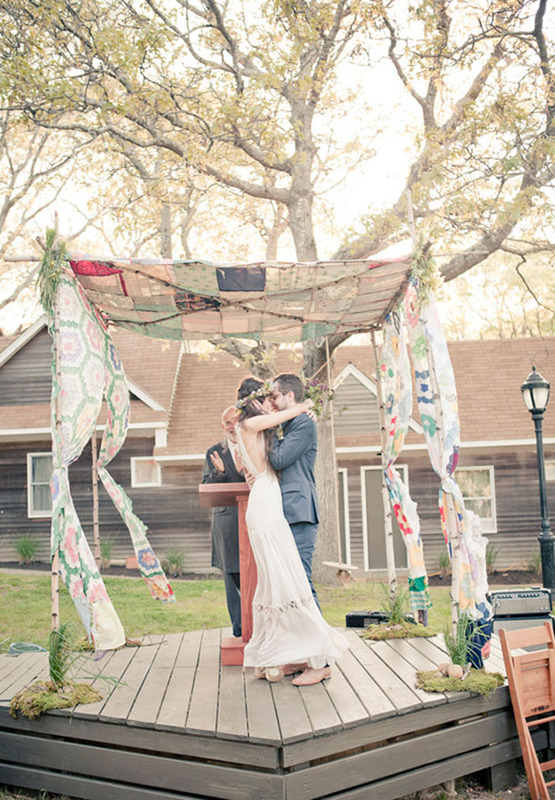 Dreaming of a boho, whimsical, flower-drenched chuppah? 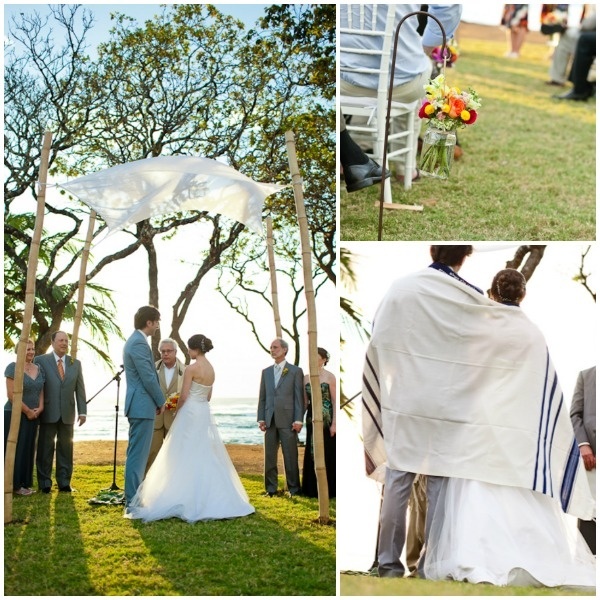 Copy Kelly and Gavin’s idea from their bohemian Jewish wedding in South Africa. 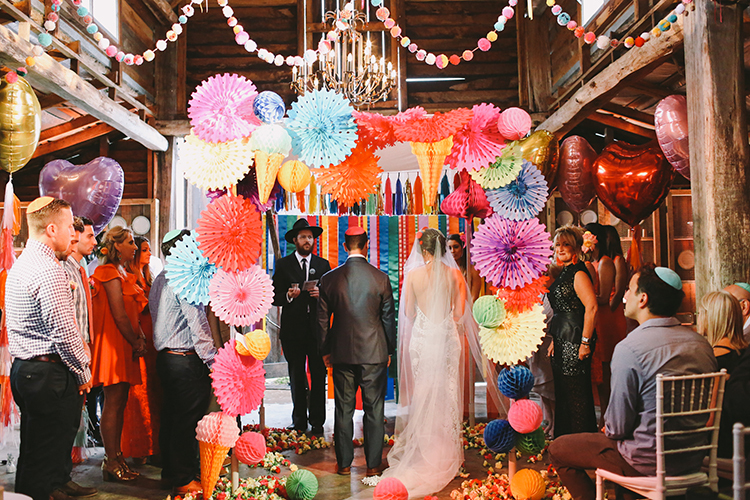 We love this colourful patchwork chuppah as seen in Hannah and Peter’s wedding! 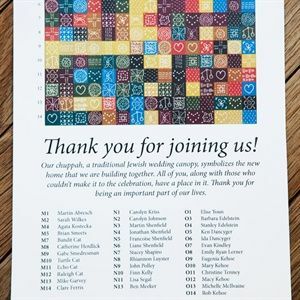 The couple asked their guests to contribute squares which were then sewn together. 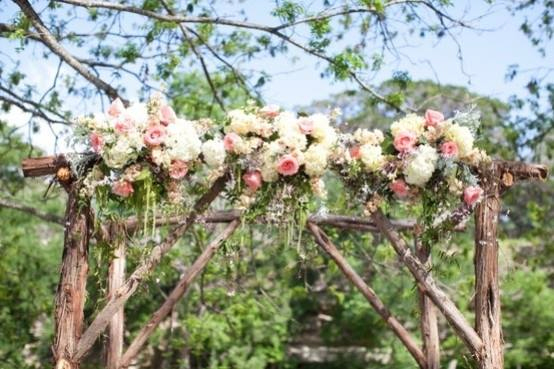 We can’t stop gazing at the abundance of cascading flowers of this rustic chuppah as seen in Jade and Adam‘s wedding! 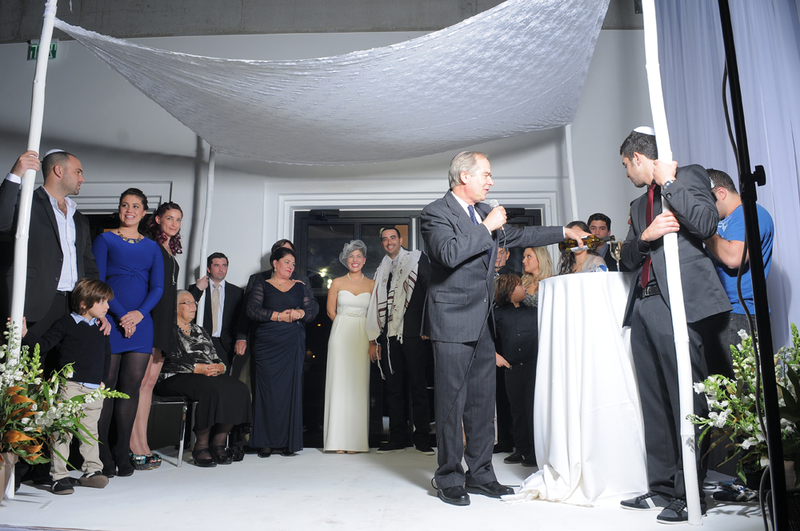 Want to make it personal and feel the presence of your relatives and friends under the chuppah? 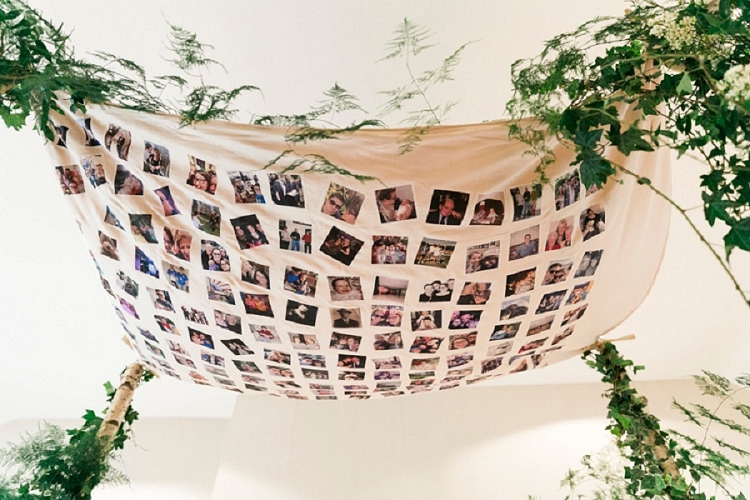 Lauren and John‘s canopy was filled with pictures of family and friends and memories and if you want to know how to hand make it, follow this tutorial. 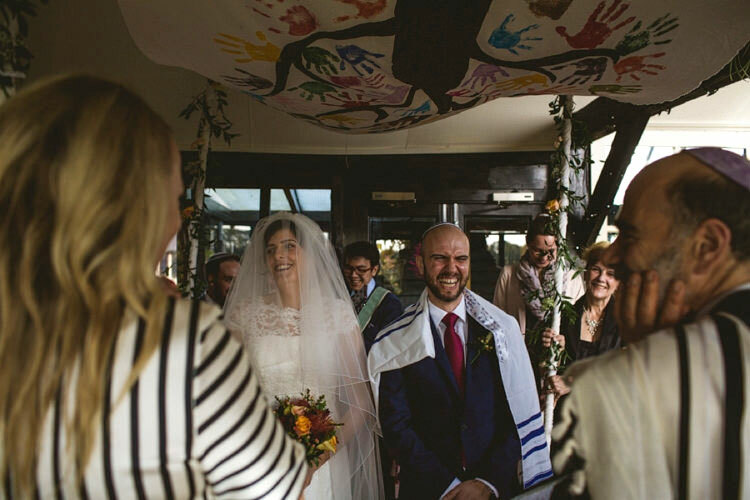 A beautiful, sentimental chuppah idea of using the tallit from the bride and grooms’ respective grandfathers accented with autumnal leaves as seen in Frances and Rudi’s wedding. 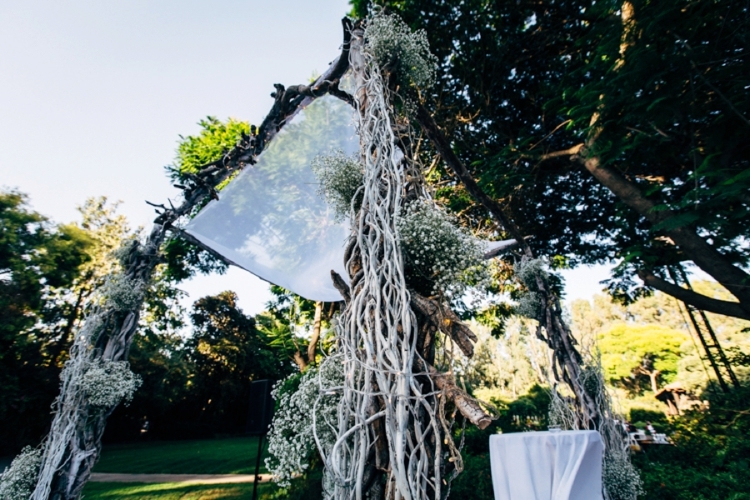 A rustic chuppah with branches and silk from Paris covered with natural and wild white flowers and greenery as seen in this fun-filled, laid-back, festival-style wedding. 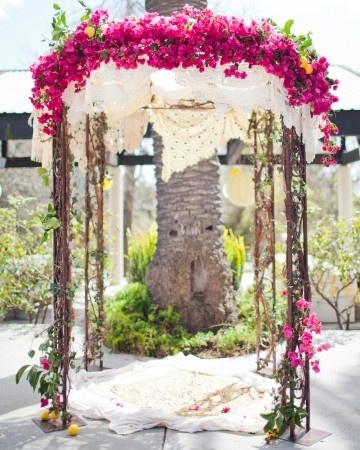 A decadently decorative floral chuppah with lots of textures and a visual impact? 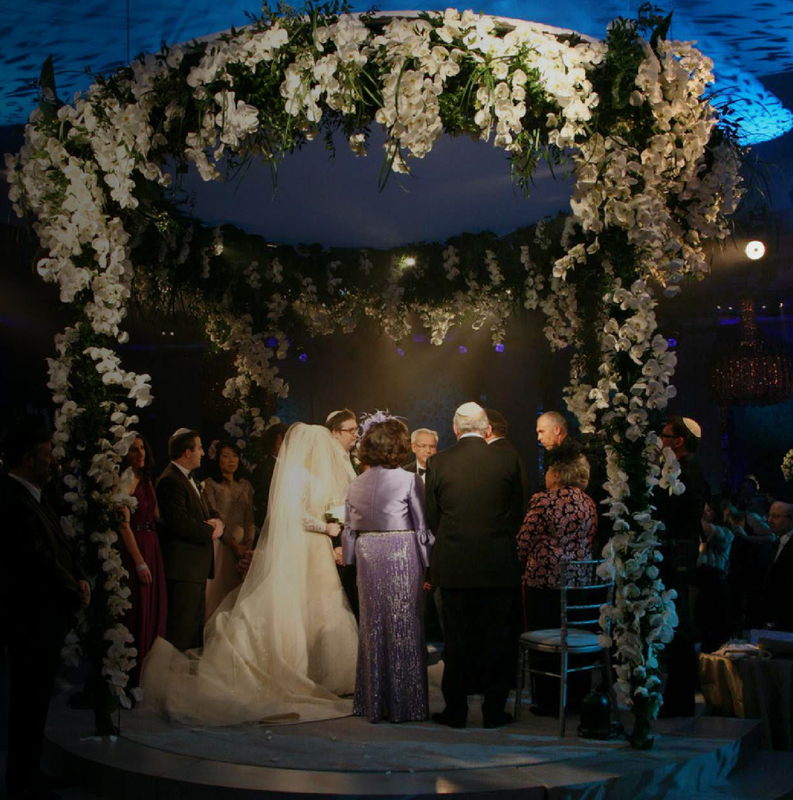 See more of this breathtakingly beautiful chuppah here. 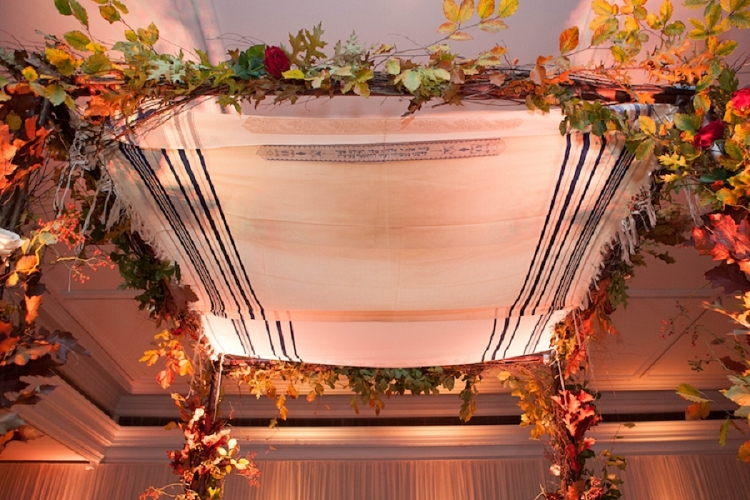 How clever is the idea of using a beam to hold the canopy of your chuppah? Generously decorated with vines and flowers, of course! 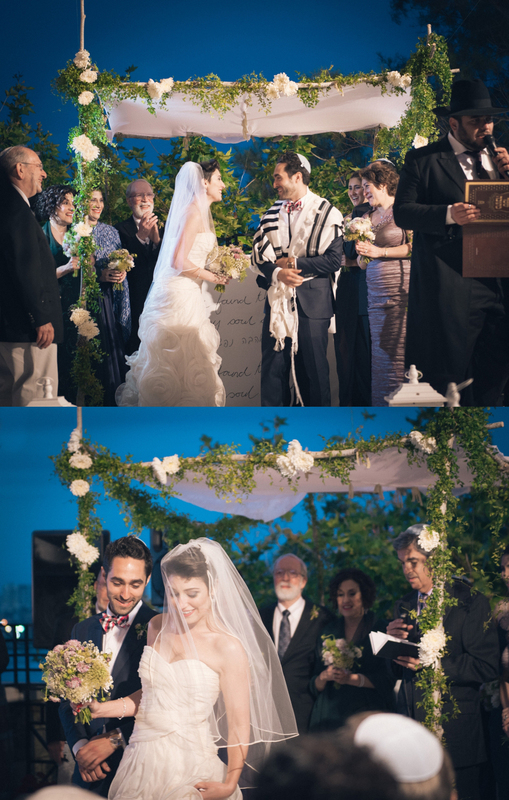 See more of this wonderful chuppah here. 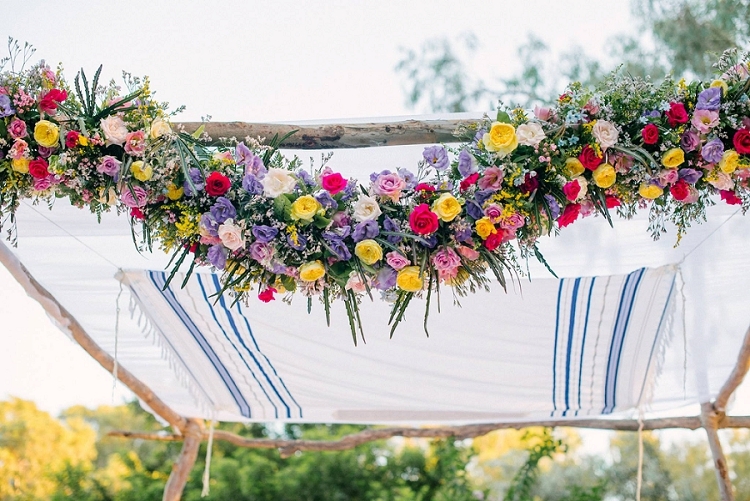 A multi-coloured tallit and seasonal flowers for this gorgeous chuppah: a real bust of colours! 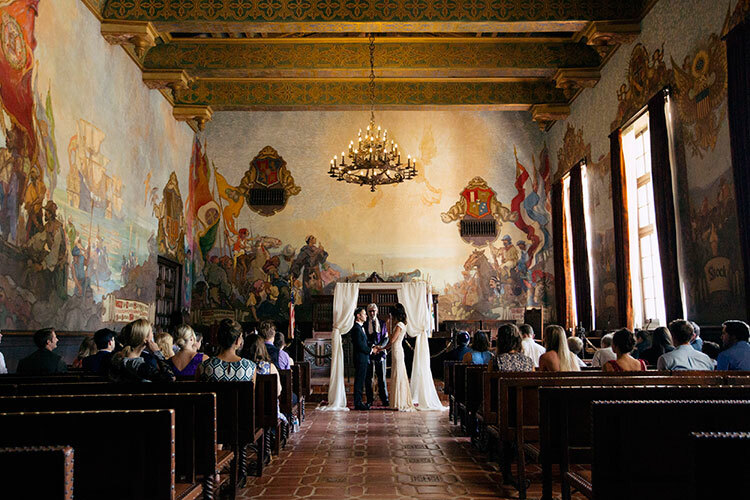 See Ashley and Adam’s wedding here. You can never go wrong with white! 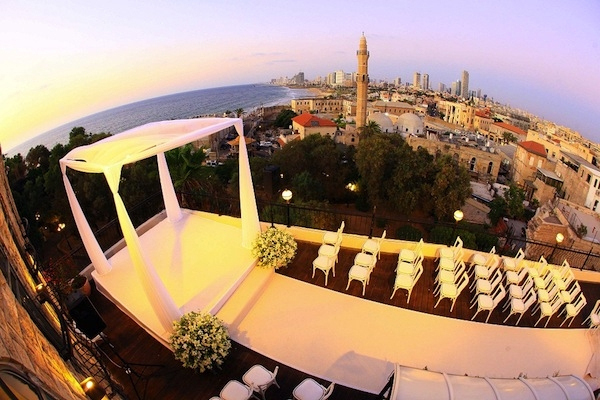 A chic and stylish chuppah as seen in Liron and Rotem’s wedding. Wow! 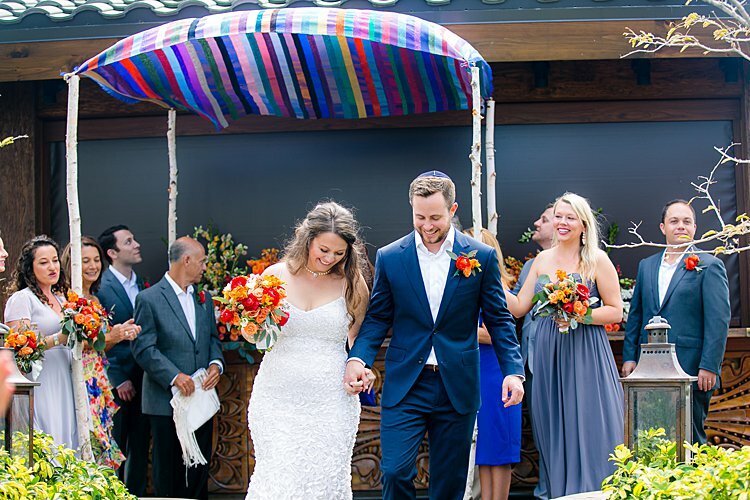 You don’t want to miss this purple and red epic chuppah from the spectacular wedding of Montana and Justin! 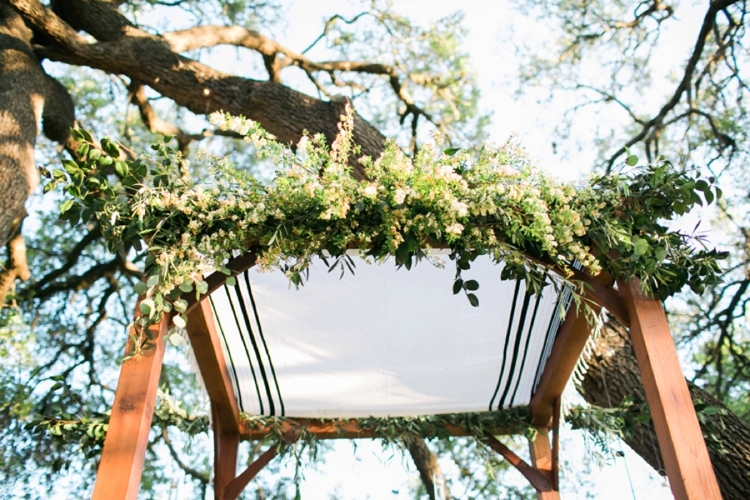 A chuppah made with woven wood canopy under an oak tree? 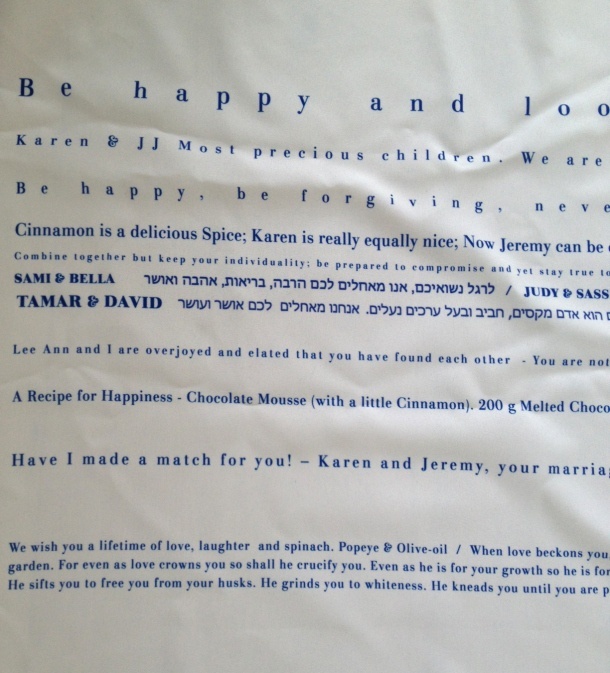 That’s what Erica and Olivier‘s went for! 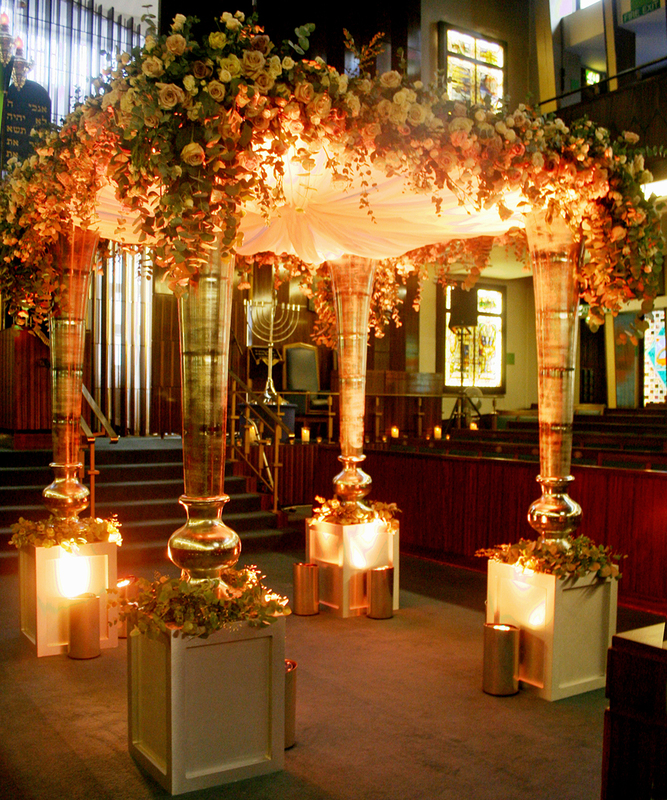 They simply added temporary poles to the 4 corners, and their florist decorated the canopy and poles with a stunning arrangement. 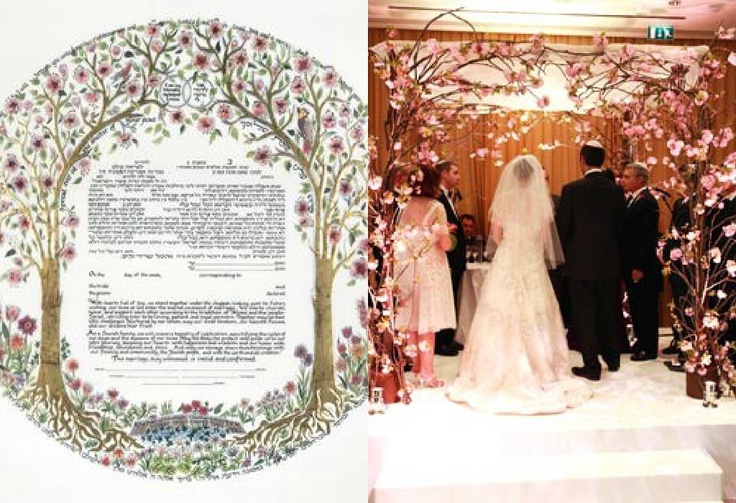 Want to decorate your chuppah with something original? 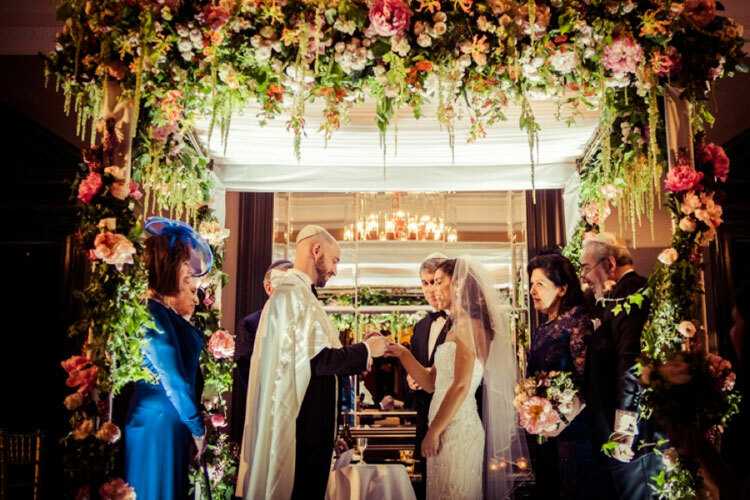 Talia and Barry adorned their chuppah with paper flowers… what a great result! 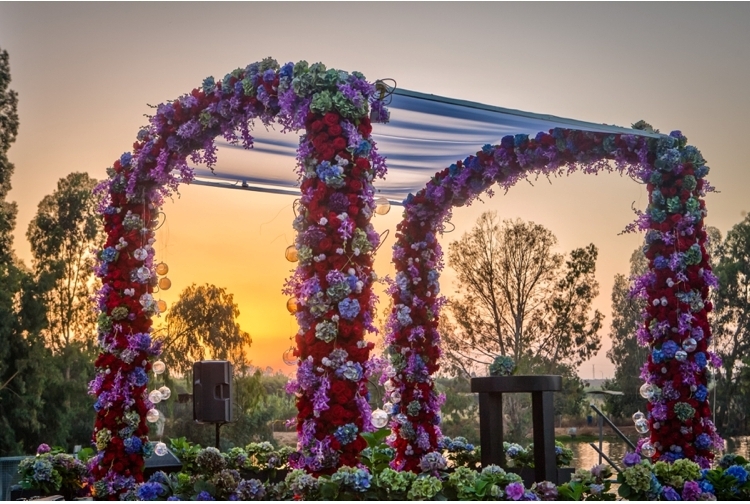 You don’t need too much colours to make your chuppah stands out! 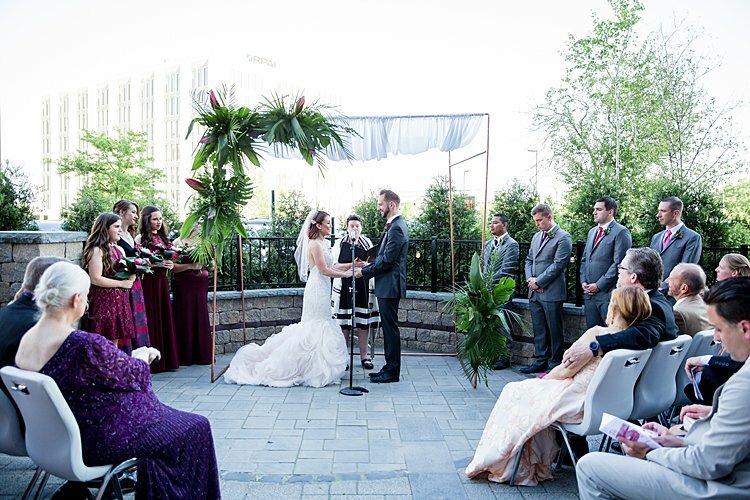 See here what Claudia and Ryan did. 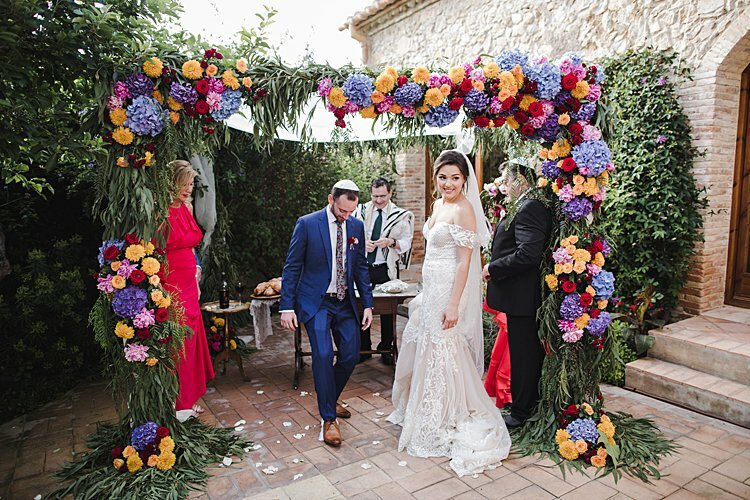 Rustic and colorful flowers together with golden paper lanterns for a DIY ‘Mediterranean meets rustic South’ chuppah as seen in Michelle and Joseph‘s wedding. 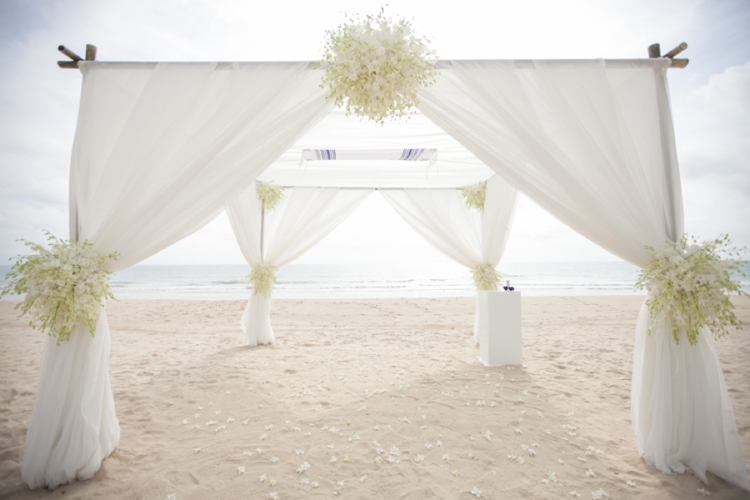 For a crisp and clean effect, why not have a totally white chuppah, as seen in Justine and Barry‘s wedding? 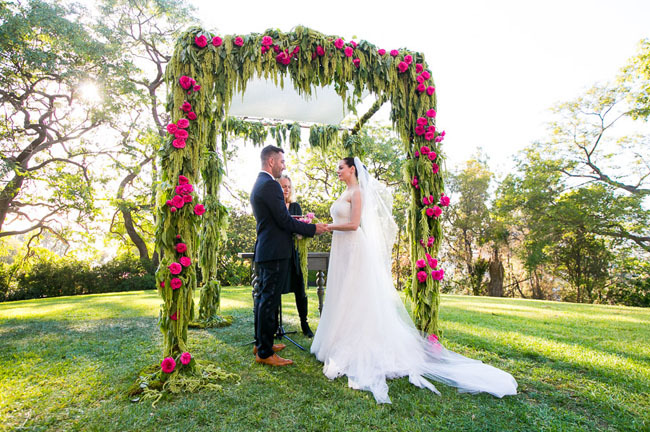 When earthy colours meet softy pastels… See Lynell and David’s wedding and their romantic foliage-draped, floral chuppah. 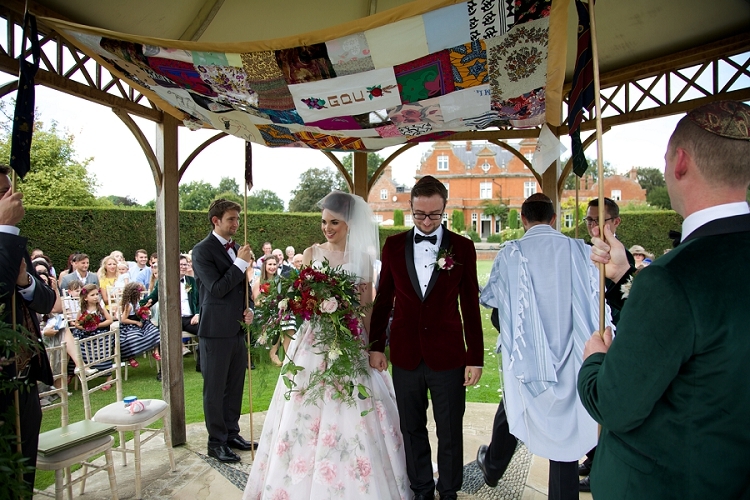 Amy and Adam asked their guests to send them a piece of fabric which meant something to them. 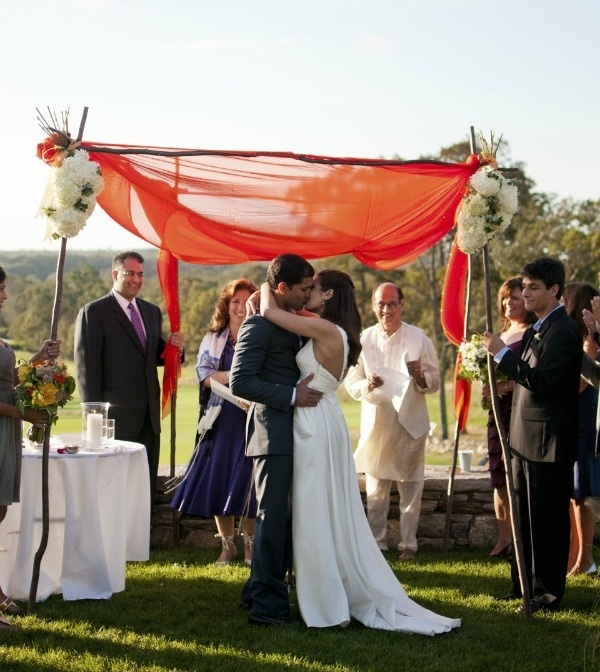 See more of their wonderful chuppah from fabric collected from their guests. 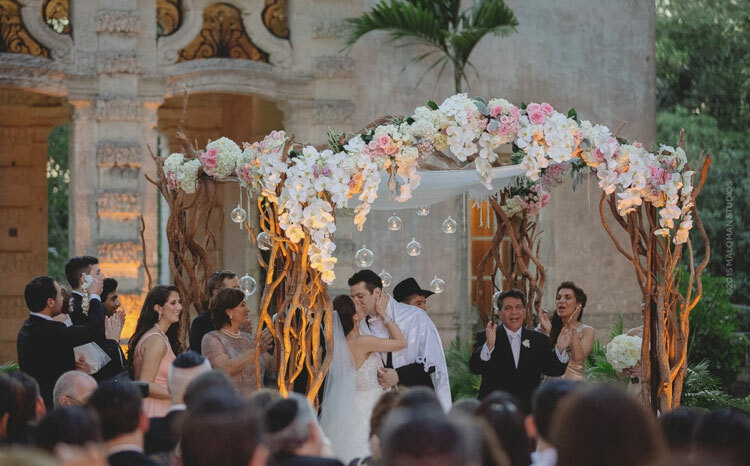 A magical chuppah made up of intertwined branches topped with hydrangeas, roses, and orchids, and candles within glass spheres, as seen in Lemor and Adam’s Jewish wedding at Vizcaya Museum & Gardens. 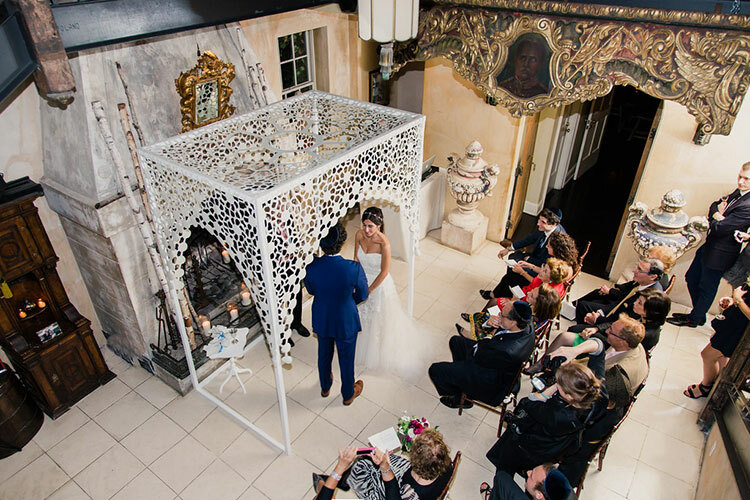 A really unusual chuppah made out of a birdcage structure, and adorned with ribbon and an abundance of flowers, as seen in Cassy & Mark’s ‘enchanted garden’ Jewish wedding. 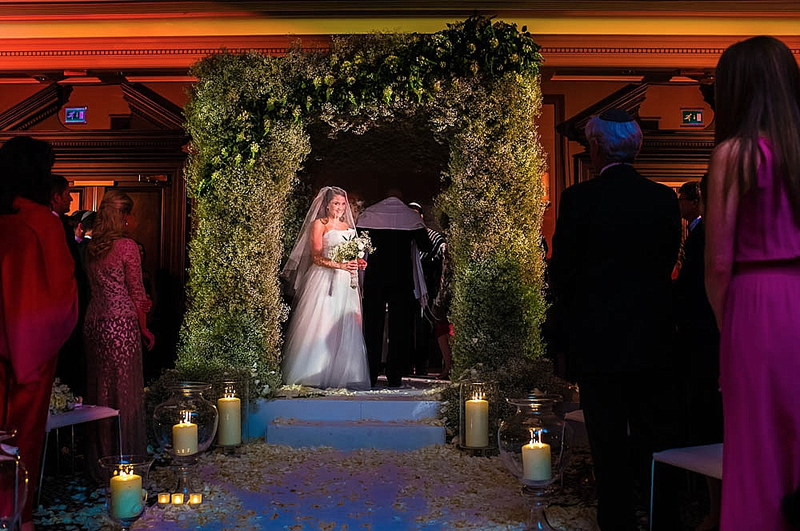 Amazing floral chuppah with lots of trailing flowers and winding greenery as seen in Lauren and George’s Jewish wedding in London. 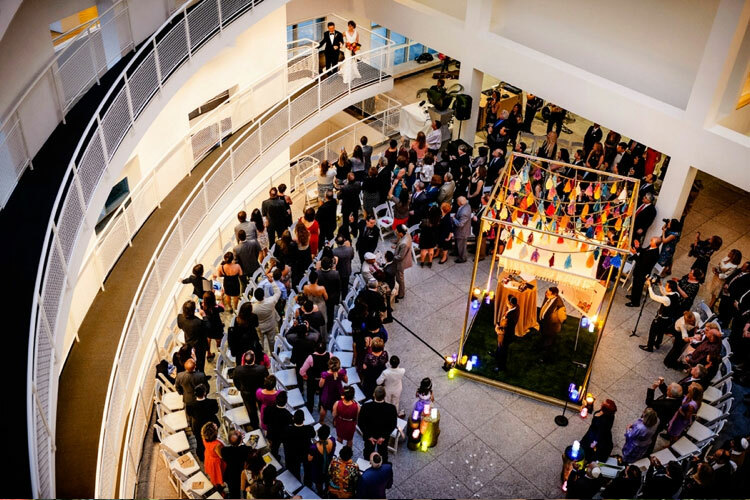 A chuppah ‘in the round’ made with colourfull tassles and pom poms as seen in Melody and Michael’s Jewish wedding full of creative surprises, at The High Museum of Art in Atlanta. 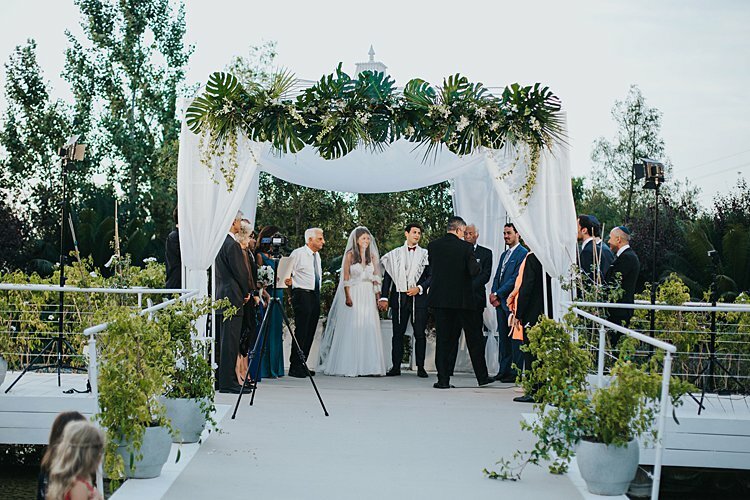 Beautifully simple outdoor floral chuppah with a talit as seen in Julie and Abe’s Jewish wedding, with a vintage botanical theme. 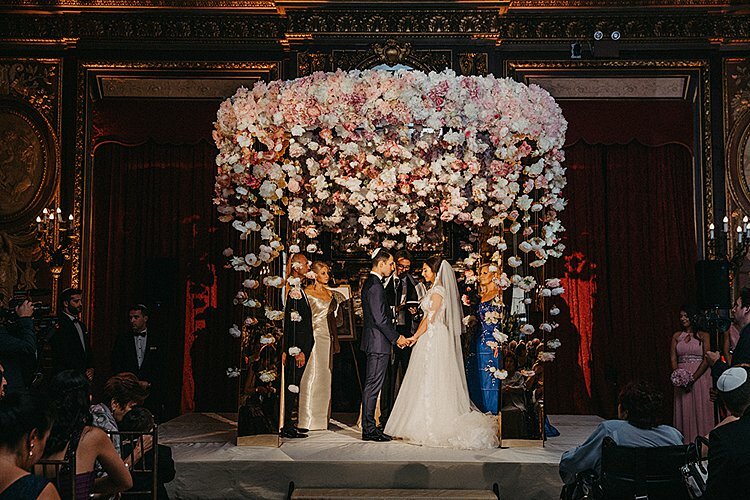 This super luxe rose-strewn chuppah is beyond beautiful. 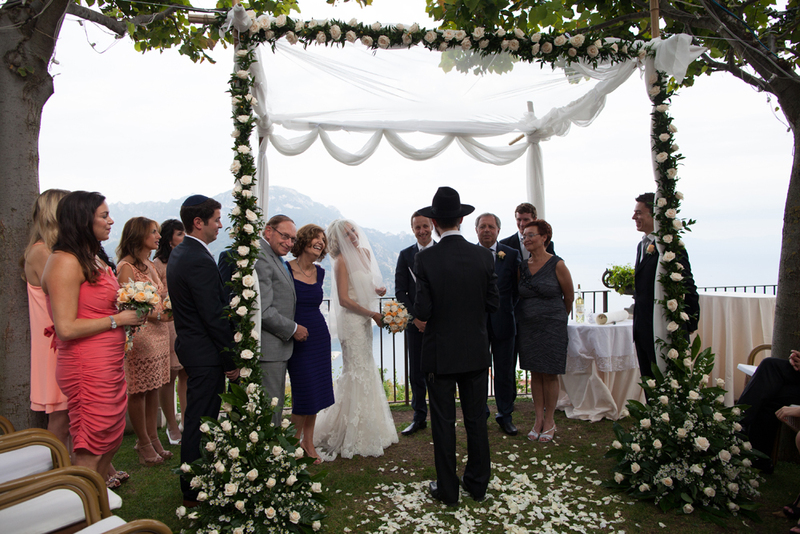 See it in its full glory in Lea and Douglas’s outdoor Amalfi Coast Jewish wedding. 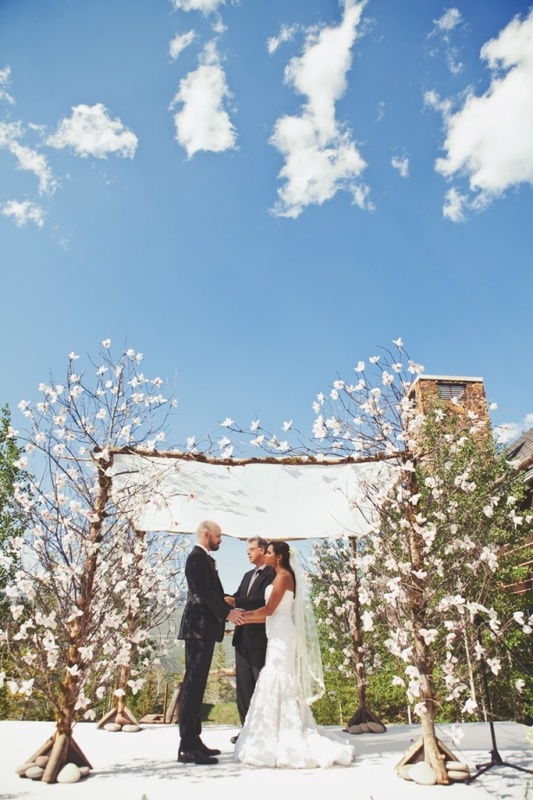 Deboroh and Hernà¡n asked all their family to make handprints in a tree shape to represent leaves on the branches on the covering of their chuppah. 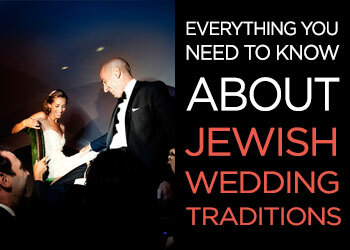 See their full Jewish wedding here. 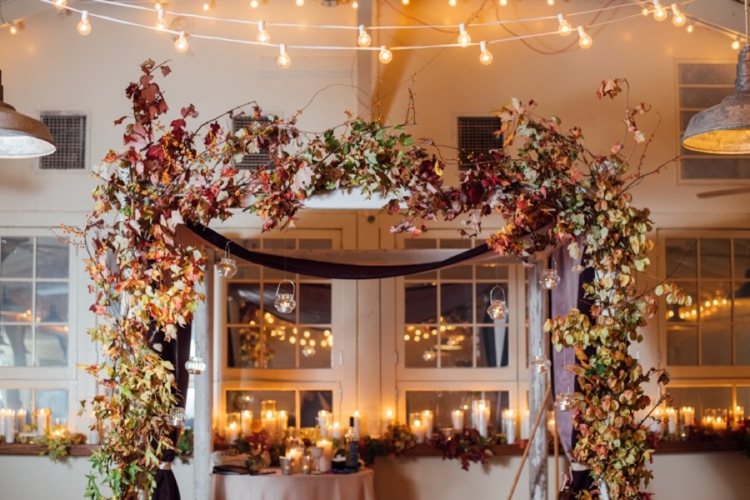 A chuppah made up of Autumn leaves and foliage, as seen in Rebecca and Daniel’s ‘Autumn in New York’ themed Jewish wedding. 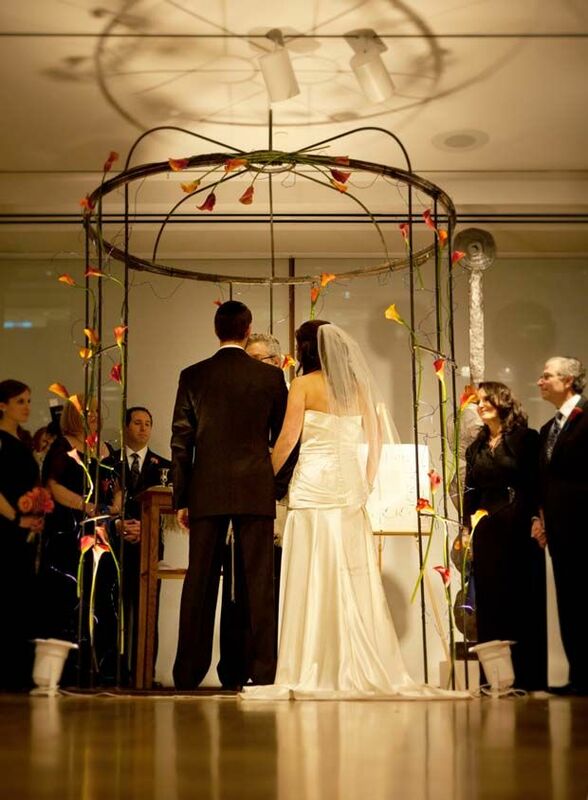 I love the trickling white, yellow and orange Gerberas trailing down from this chuppah. 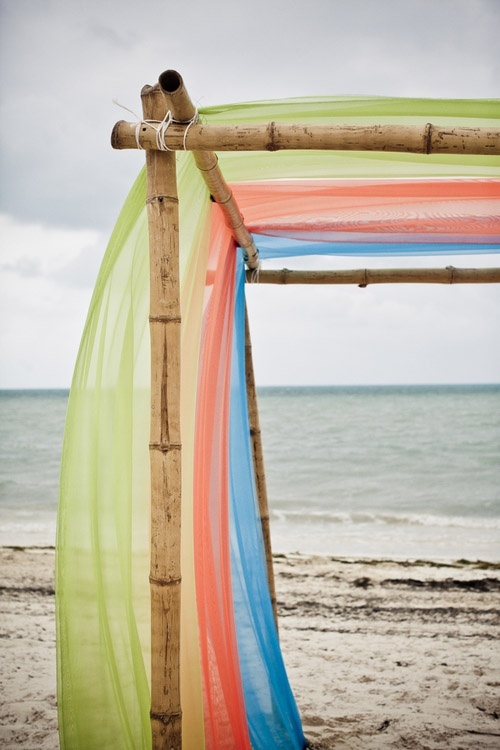 So very pretty, so very simple and so very effective. 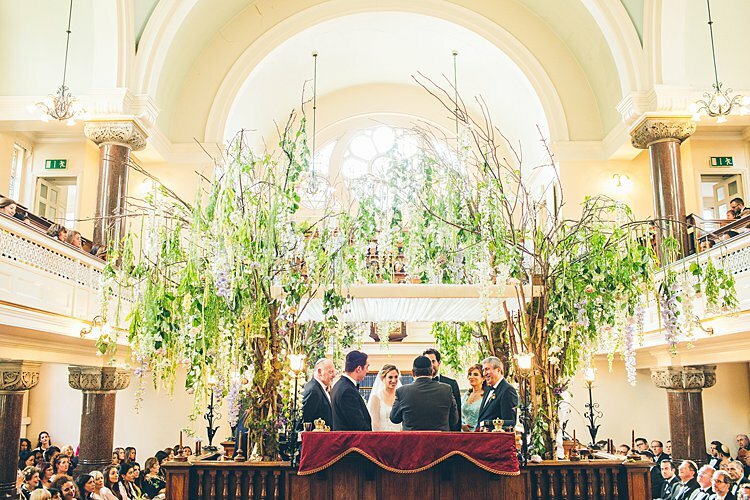 See the full wedding on Smashing The Glass here. 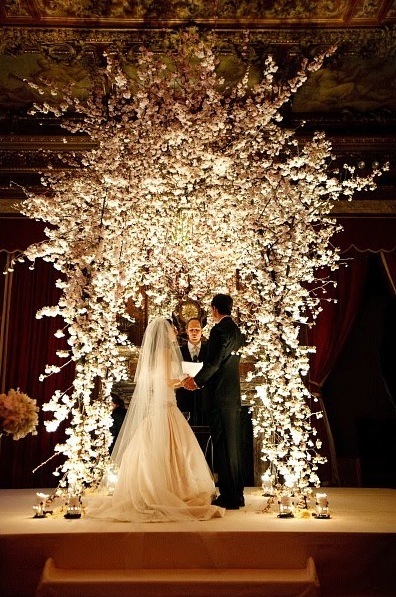 Wow – look at this peach blossom chuppah by Gloria Baker Florals. Utterly breathtaking! 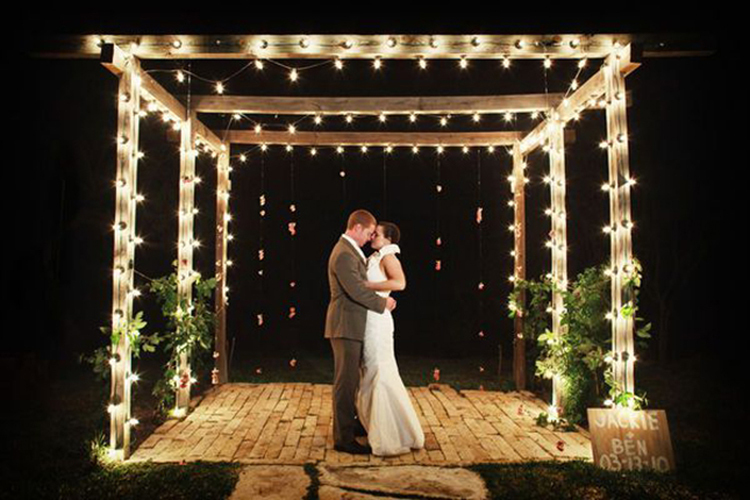 For an outdoor night time ceremony, how about string lights and bulbs on your chuppah for a bit if classy pizazz?! 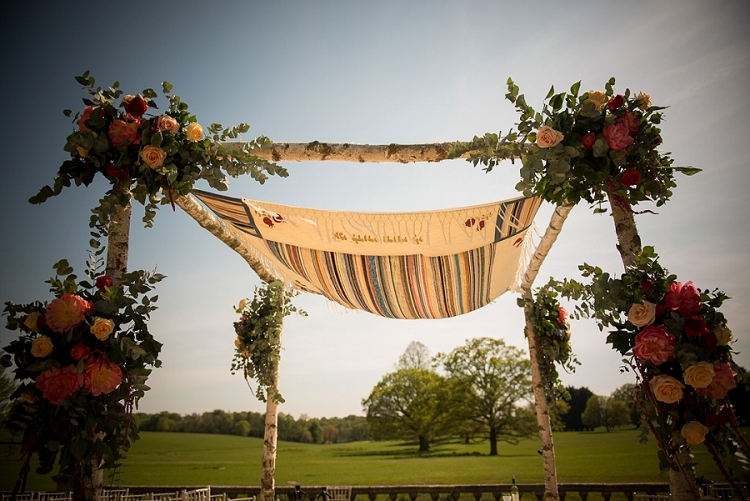 Have you ever seen such an incredibly creative and colourful chuppah as this? I love it! 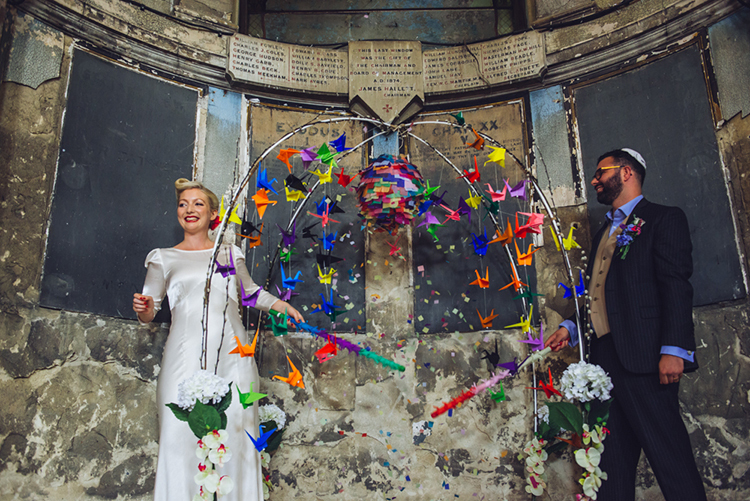 See it in all its glory and read all about Gena + Tony’s super colourful wedding. 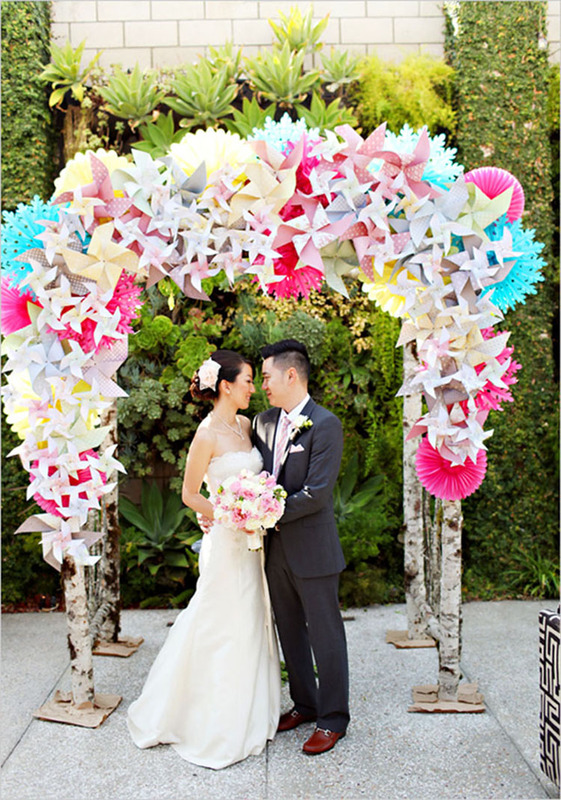 A chuppah made from pinwheels? Whatever takes your fancy! 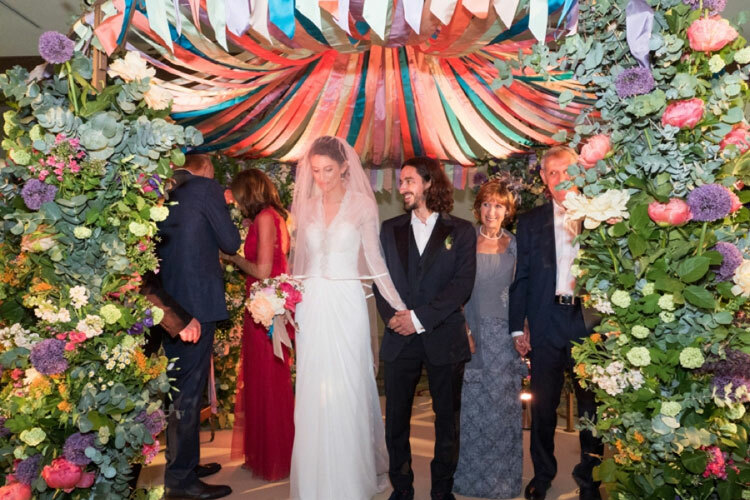 I love this wonderfully spiritual and ethereal chuppah from Amanda and Brian’s romantic elegant London wedding at the Rosewood Hotel. Over the top, but why not?! 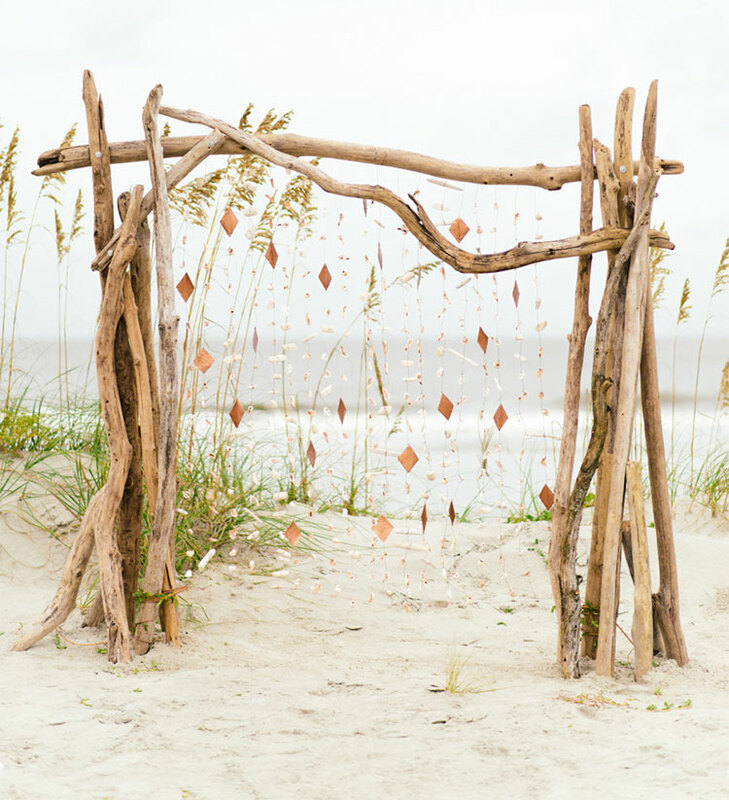 I love this beach chuppah made from driftwood. 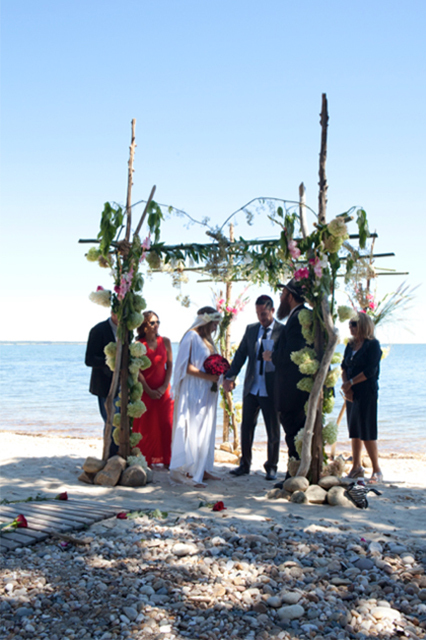 It’s from Girls star, Jemima Kirke’s wedding to Michael Mosberg. 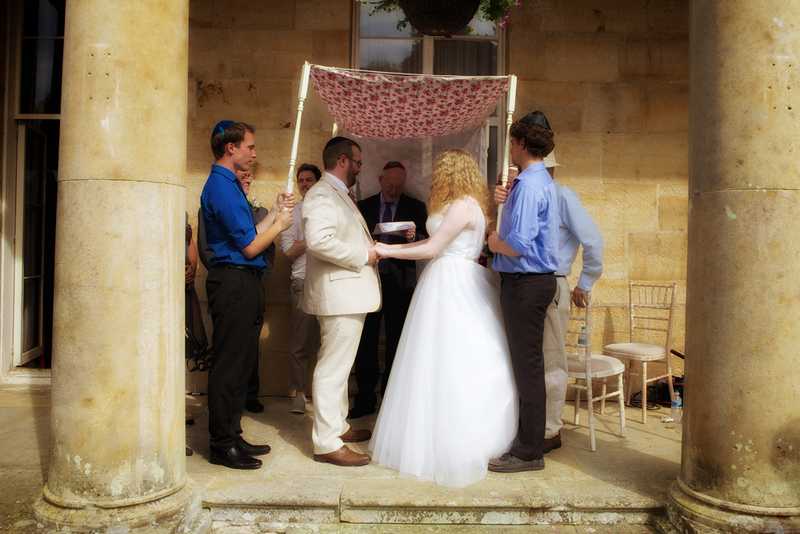 A chuppah spelling out the word ‘chai’ in hebrew, which translates as ‘life’. 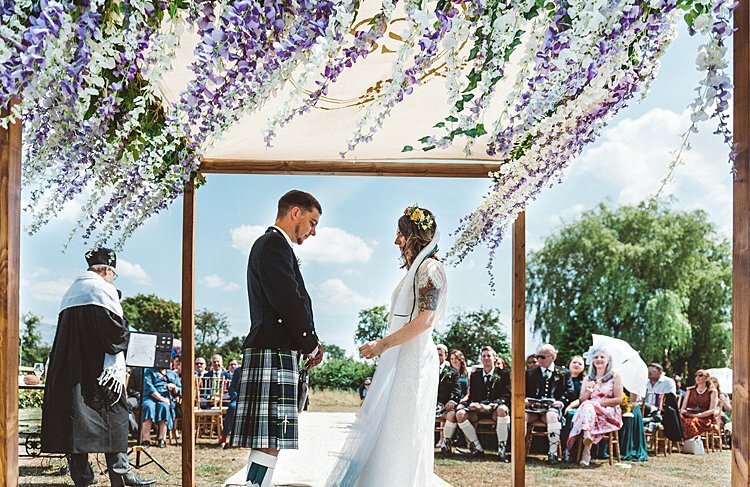 Some may consider it OTT but this is how this gorgeous couple chose to personalise and add symbolism to their ceremony. 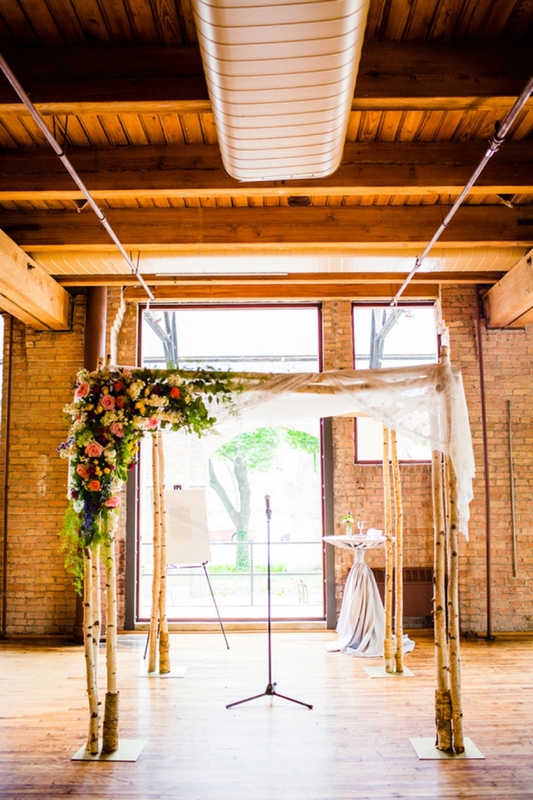 How glorious is the quilted chuppah above? 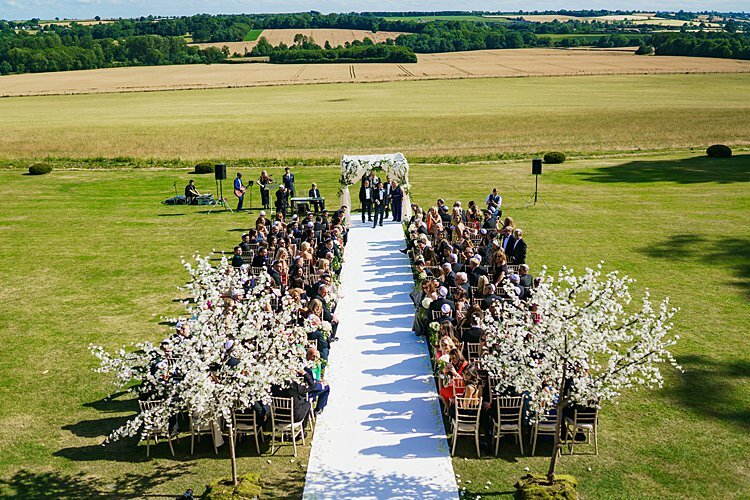 It is one of the most meaningful and moving chuppot I’ve ever seen – it’s a tribute to the bride’s mother who tragically passed away just as she was embarking on her wedding planning. 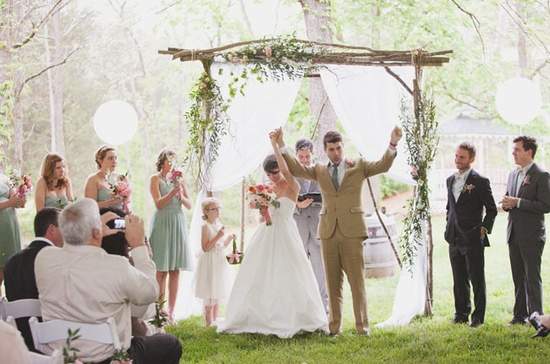 Read the full story of this wedding right here. 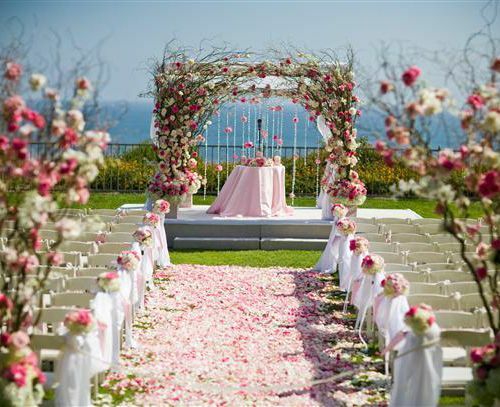 Such a pretty fuschia and grown outdoor chuppah from actress, Rose McGowan’s wedding to her artist husband, Davey Detail. 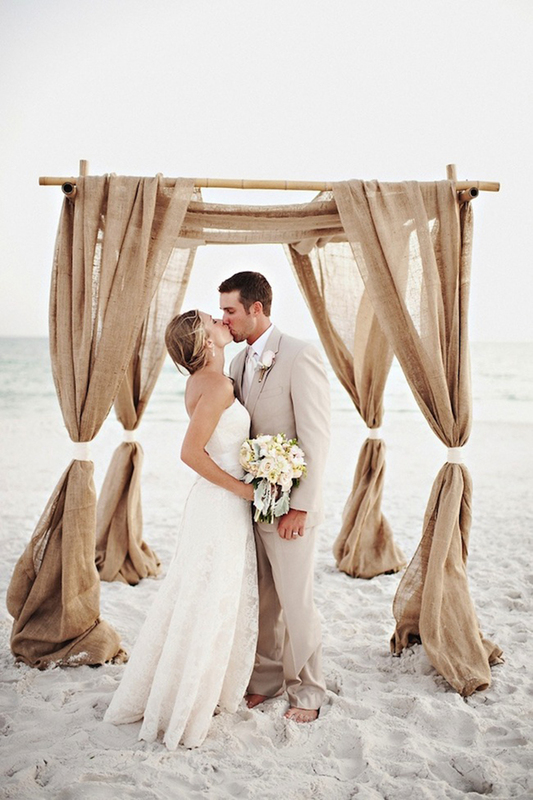 Burlap chuppah – perfect for a sandy, beach wedding! 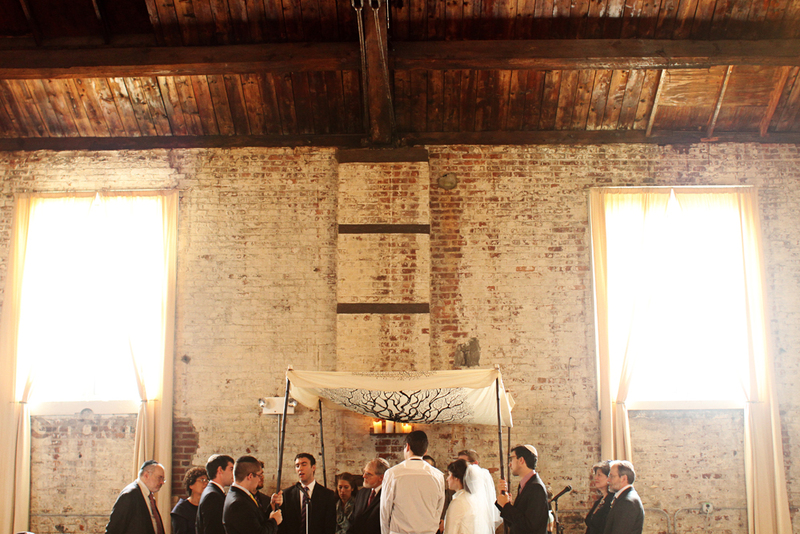 Beautiful rustic chuppah as featured in Jessica and Pete’s full moon wedding. 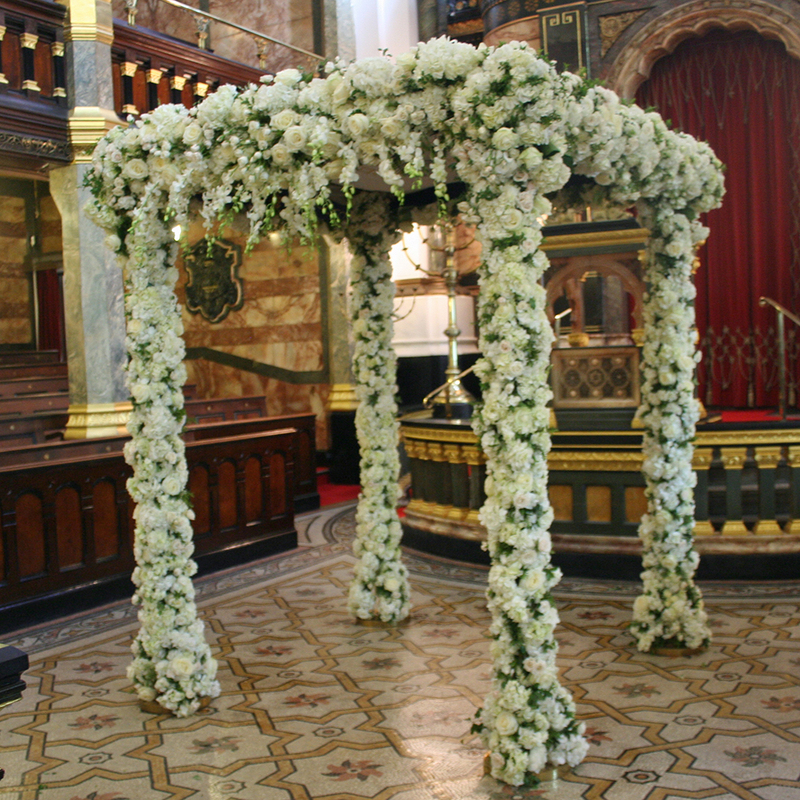 Ornate floral chuppah made from Avalanche roses, Majolica spray roses and ivory hydrangea at the West London Synagogue by Mary Jane Vaughan. 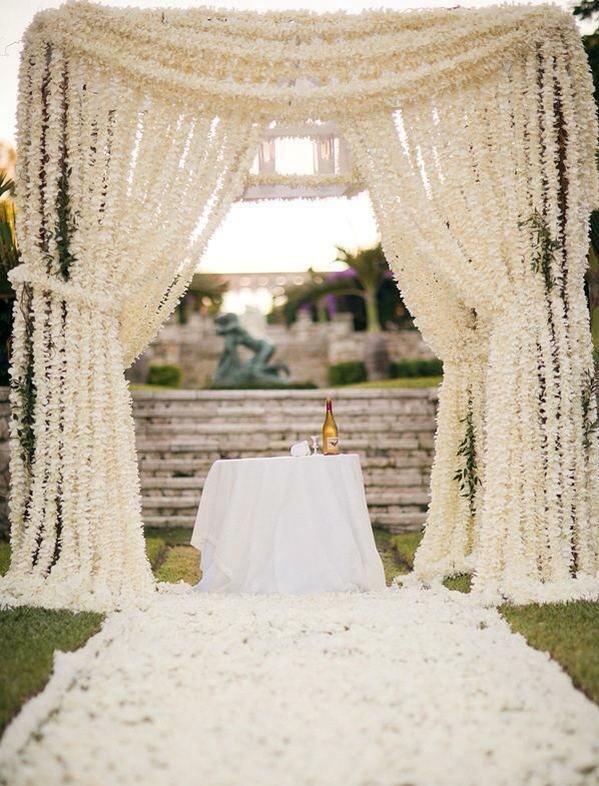 A beautiful chuppah made from chains of gorgeous white flower heads. 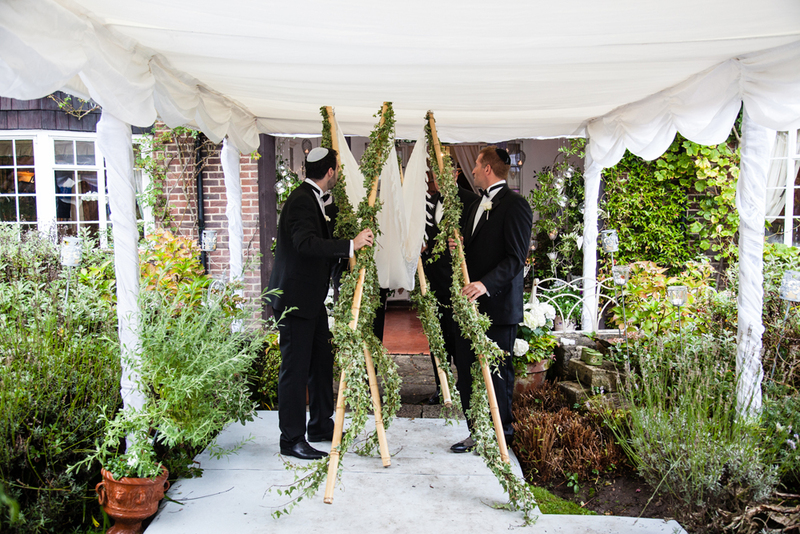 Ivy Clad Chuppah with 4 poles held by 4 close family members as featured in Emma & Simon’s Enchanting Garden Wedding. 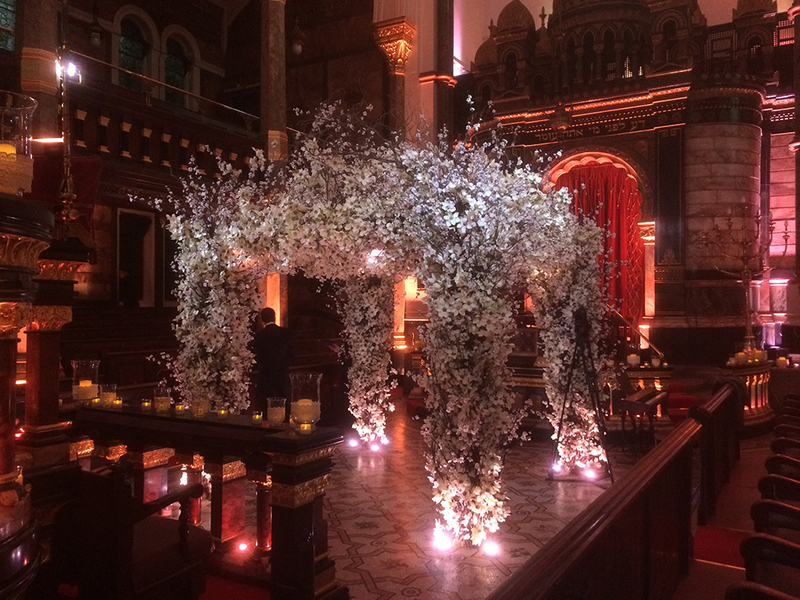 A huge magnolia and white cherry blossom chuppah (made using 3000 individual stems) made for a London wedding by Essential Couture. 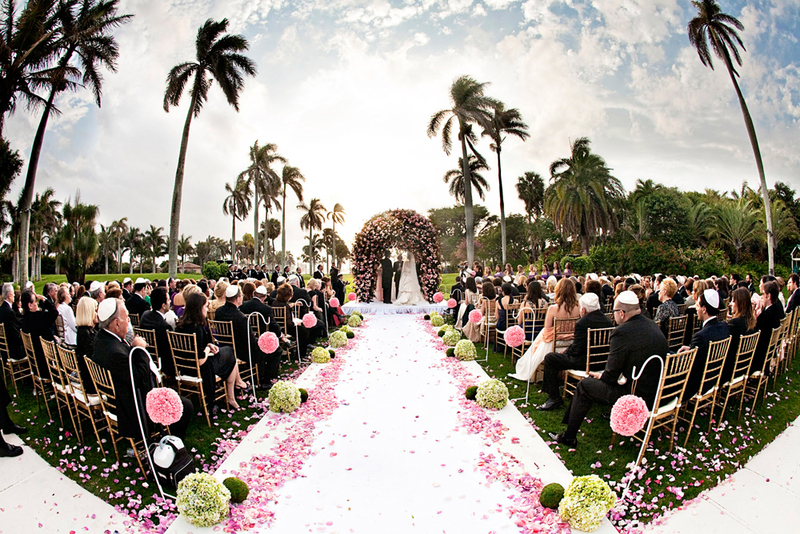 Flower strewn chuppah as featured in Starr and Jacques’ breathtaking ‘Palace of Versailles’ themed wedding at the Mar-A-Lago Club, Palm Beach Florida. 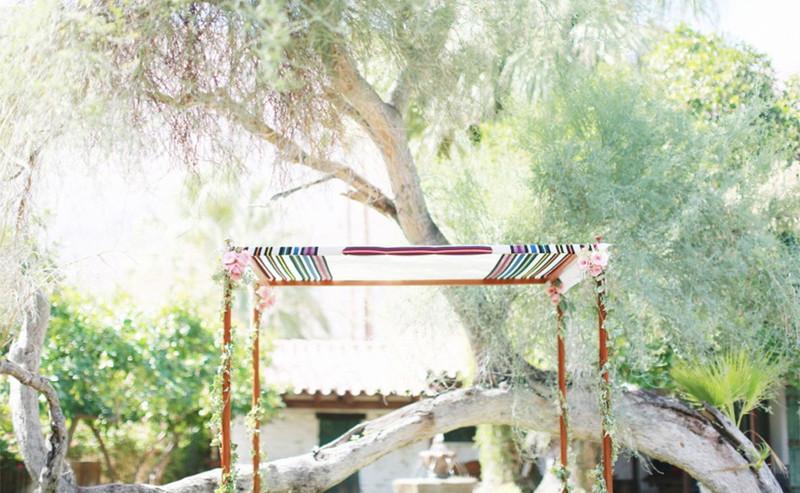 Quilt chuppah as featured in Sara & Ben’s gloriously colourful and creative California wedding. 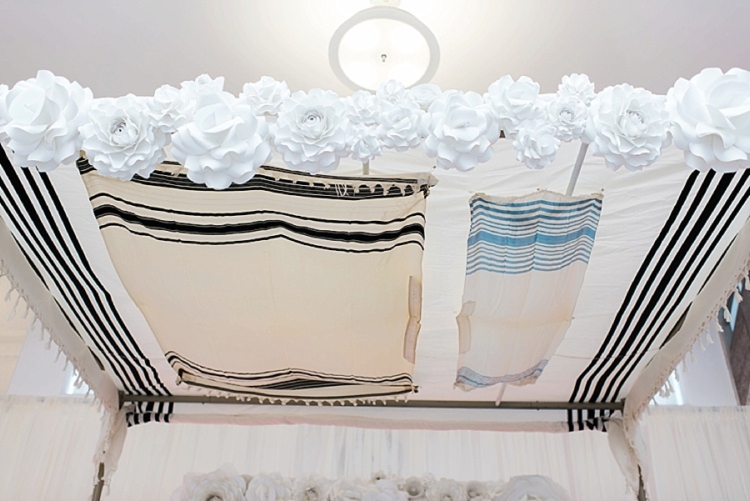 With a quilted chuppah you can integrate small pieces of your past like a school uniform or a bed sheet or fabrics that you love. 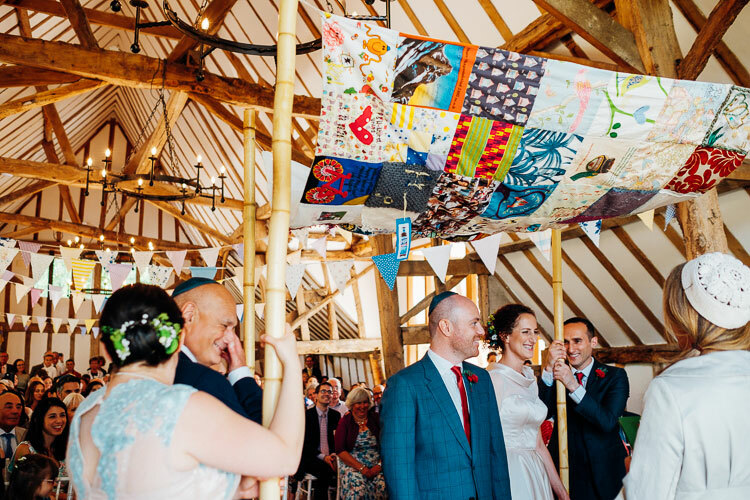 Once the wedding is over you can enjoy it as a lovely moment by using it as a quilt for your bed or a wallhanging. 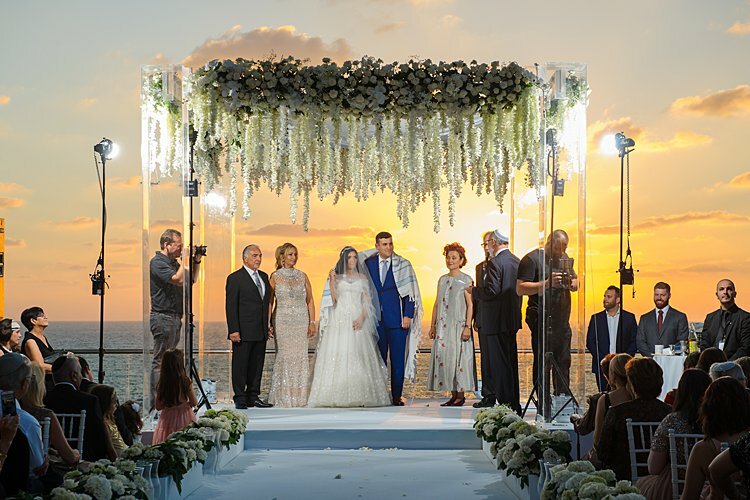 Lace chuppah with four chuppah holders as featured in Kim & Shay’s 1920â€²s Inspired Israeli Wedding at Citrus, Even Yehuda, Israel. 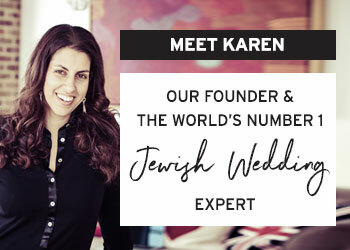 As seen at Karen & Jeremy’s Wallace Collection wedding, ask your guests to contribute to your chuppah design by asking them to compose a short message that you can then incorporate into your chuppah canopy design. 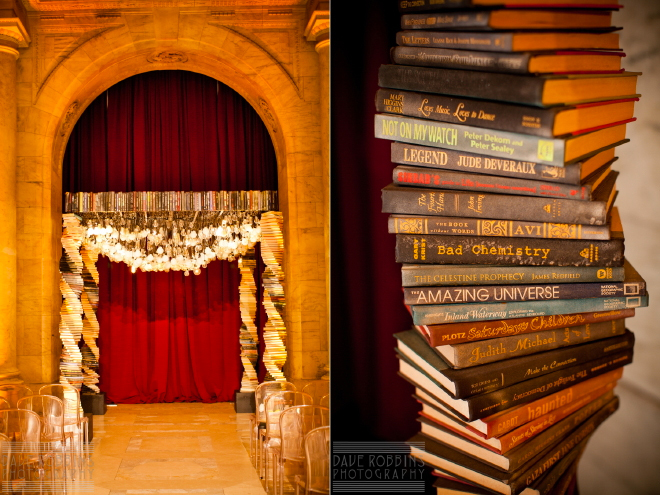 This is also a lovely way of including guests from abroad that aren’t able to attend in person. 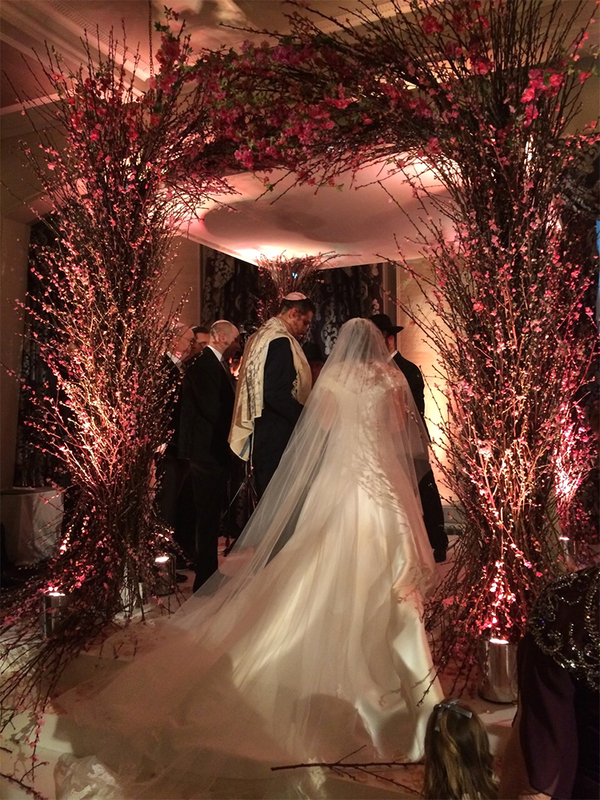 Flowering branches for a chuppah. Beautiful metaphor. 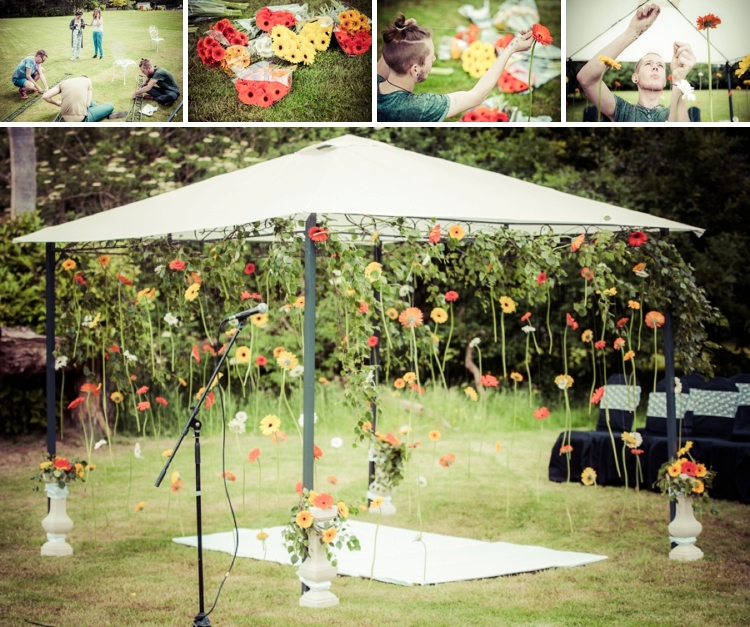 Before splashing out on renting or buying a chuppah from your florist, why not build it yourselves? 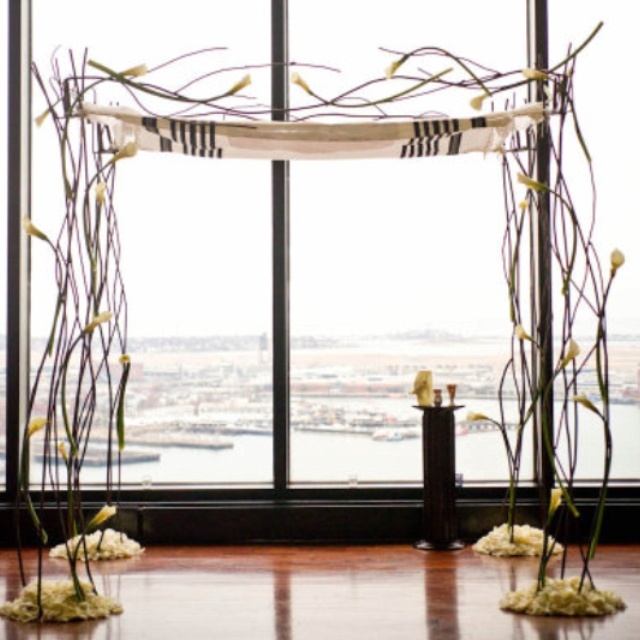 It will feel more meaningful and even more personal with you 4 chuppah holders. 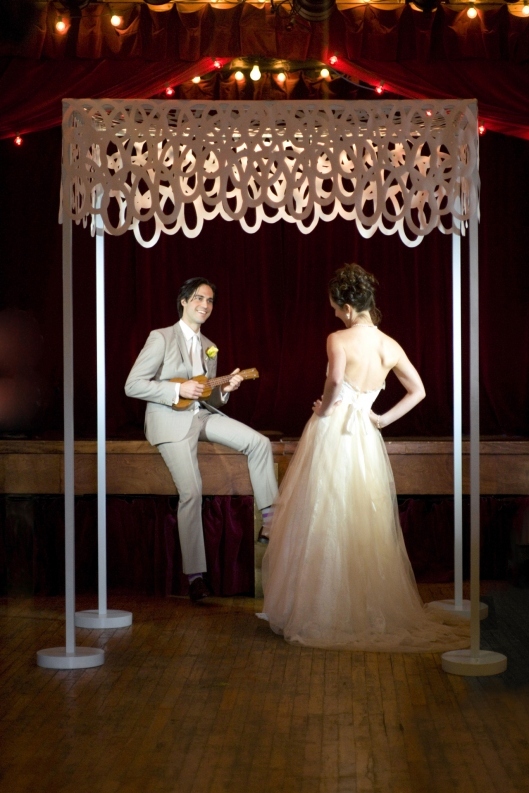 Here are some simple instructions on how to build your own wedding chuppah with inexpensive materials. – Fabric. 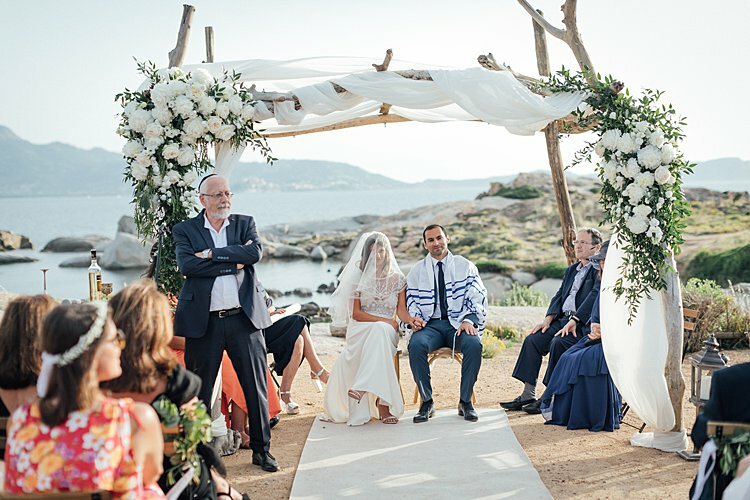 Some options: plain white sheet of fabric, a traditional tallit, a quilt sewn by someone close to you or made up by separate squares by your guests, colourful fabric that compliments your wedding theme. 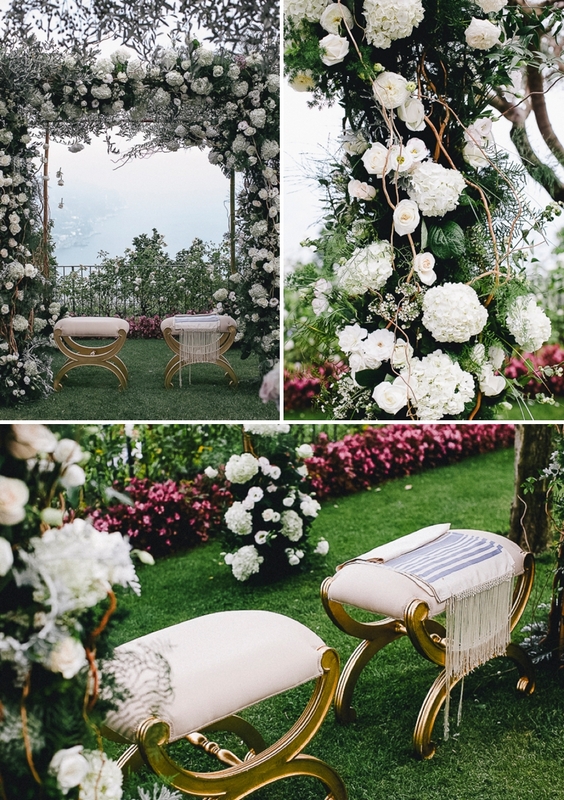 For more inspiration see ideas from the top of the page. Step 2: Drill holes into the poles. 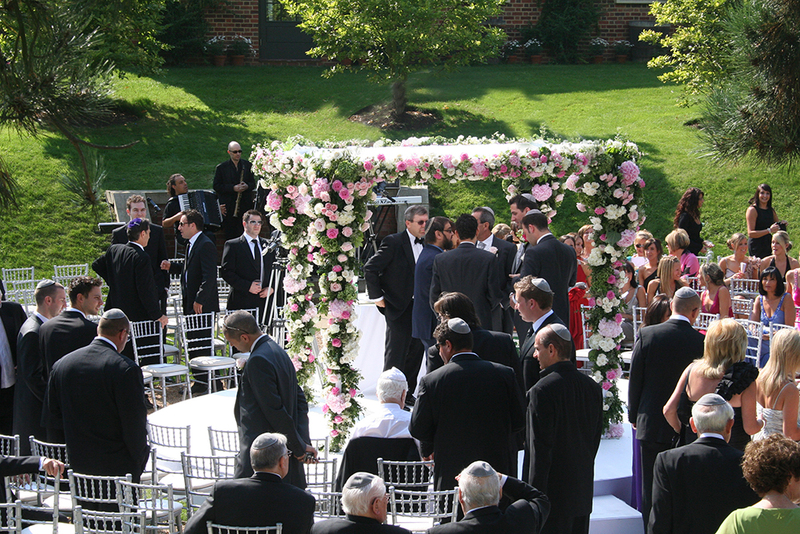 Step 4: Placing on the fabric: There are several ways to place the fabric on your chuppah framework. 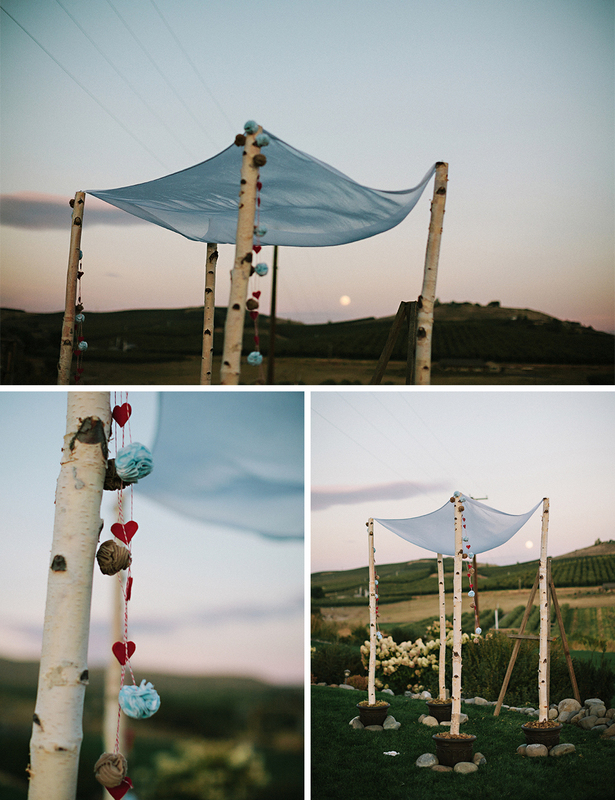 Attach strings of fabric to the sheet of fabric to be tied onto the corners and loop them round the poles. 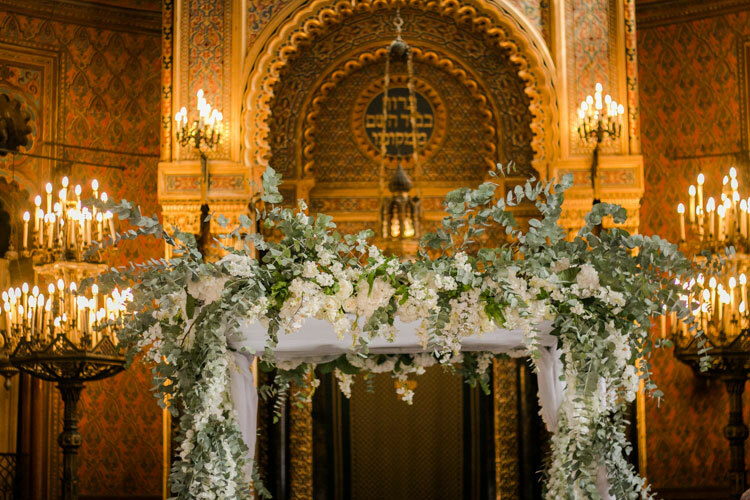 Step 5: Use flowers or artefacts to match your theme ,or anything that’s personal to you both, and decorate the corners of the chuppah to cover any unsightly corners. 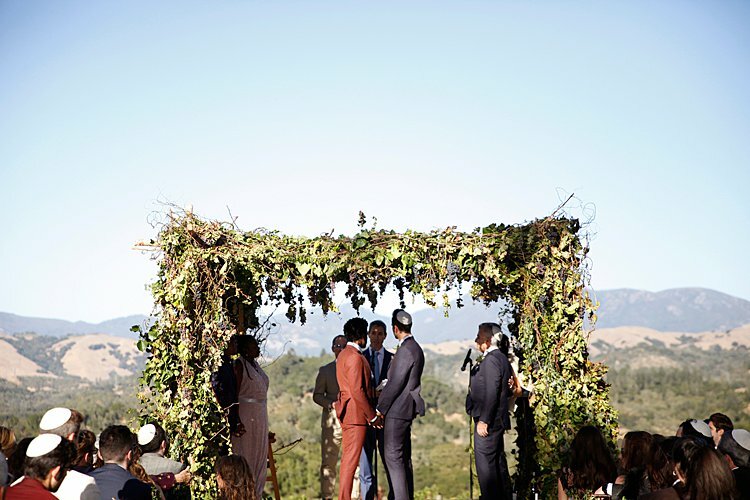 The chuppah, as built above, is not free standing and would have to be held by four important people to you both (they don’t have to be Jewish, or even male, so this is a lovely way of honouring those important to you who are not necessarily already in your wedding party). 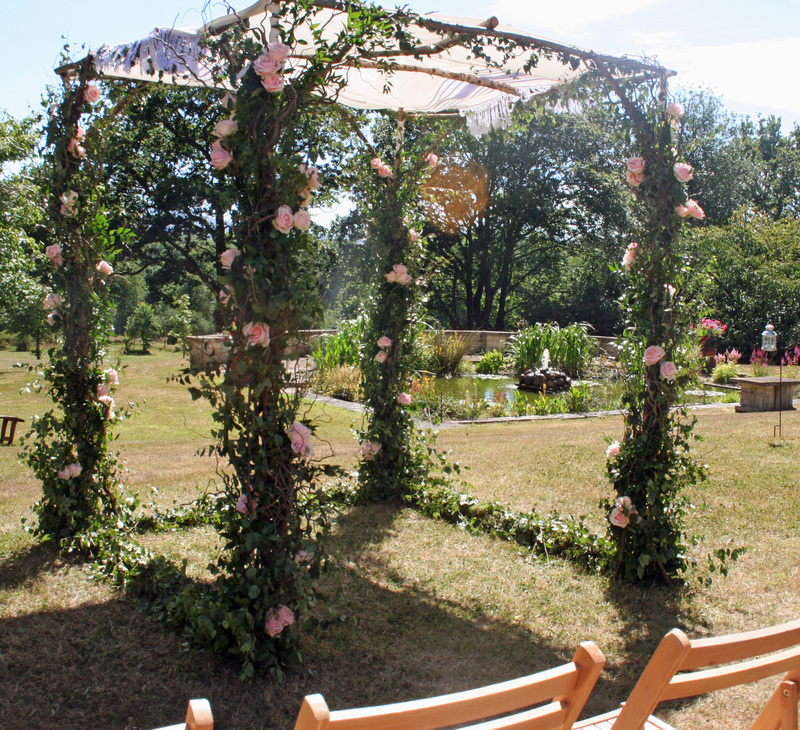 If you would like a free standing chuppah, each post can sit in a flower pot filled with earth or stones. Keep in touch! Check out Smashing The Glass on Facebook, Twitter, Instagram and Pinterest.